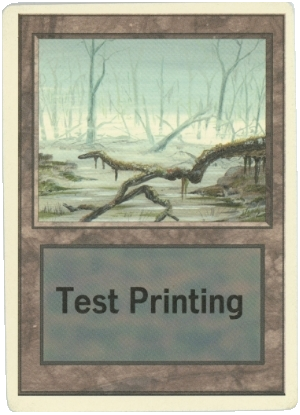 Test prints are cards created to test new printing processes. They are not meant to be released into the public, but occasionally some of them find their way. 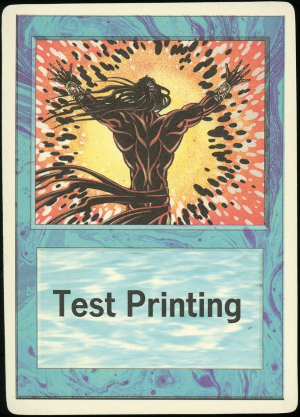 "Test Print" definition: A card intentionally manufactured in a controlled manner and used to investigate a new design or printing process. 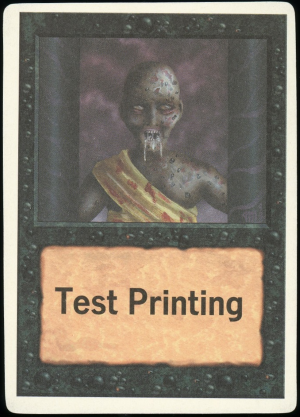 Test prints are typically reviewed by the WotC designers to determine which variation of a process would be best, and must be of adequate quality to serve their intended purpose. 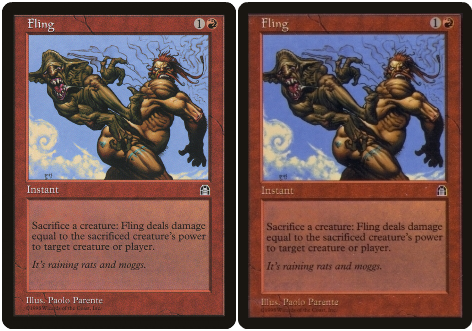 "Misprint" definition: A card which does not match the intended final result for the entire printing run. Misprints include cards such as those with odd coloration, missing text, and those which were miscut. 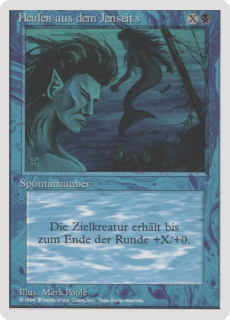 Misprints also include cards which are used by printers for press checks at the start of a run, which accidentally are included in distribution. "Filler" definition: A card routinely manufactured during a normal printing run which is used to occupy an unneeded spot on a printed sheet (e.g., card spot #121 on a sheet used to print two, sixty card preconstructed decks). Filler cards are typically removed from the sheet during packaging but occasionally some are missed and are included in packs. 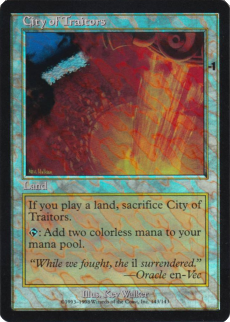 Foil City of Traitors: Test print. 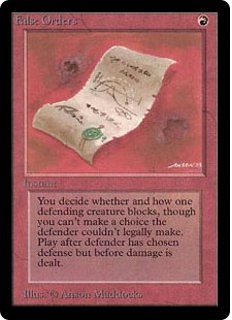 Used to determine the best parameters for foiling a card. 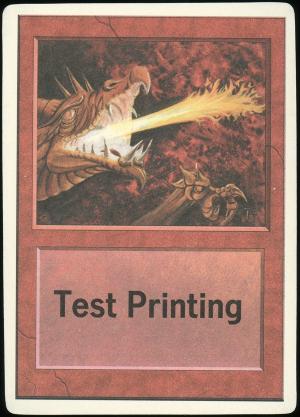 Double-backed Magic card, one back has white border: Test print. Card was used to investigate a change to the Magic card back. 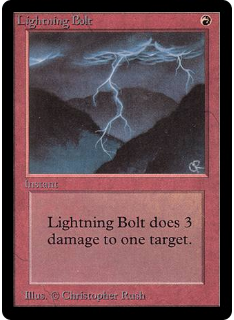 Foil Textless Bolt: Misprint. 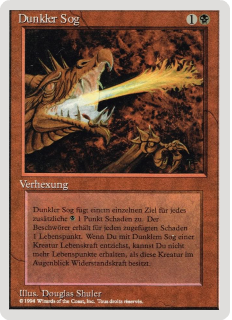 The card was not being used to develop a new foiling process, it was simply a card which did not match the intended final result for the entire printing run. 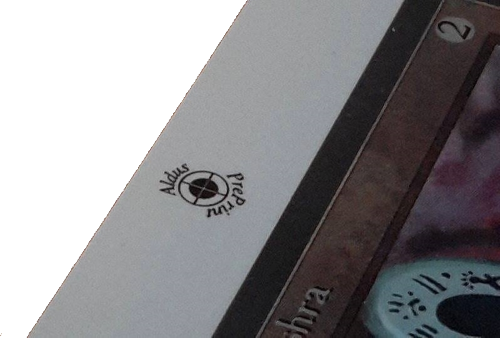 Maybe it was a press check and they realized the black ink was off, but the intended result of that printing run was not to produce a foil Bolt without text for review of a new design. 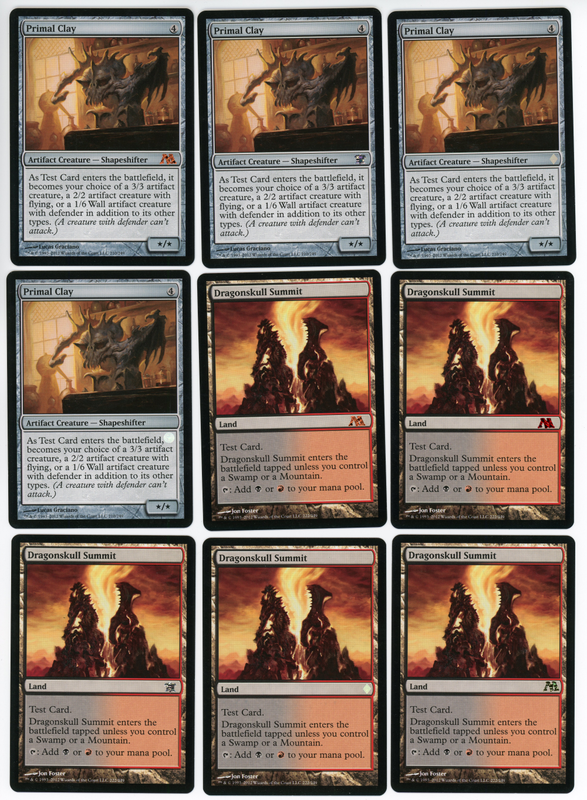 Albino Fires Precon Deck: Misprint. 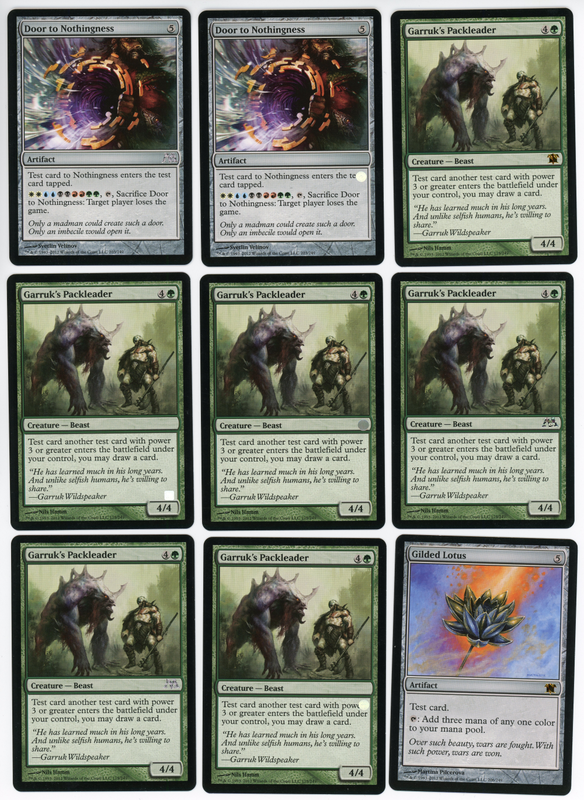 The intent of the entire run was not to make albino cards for review. Double-sided Ishan's Shade: Misprint. There is no logical intent to investigate a new design aspect. 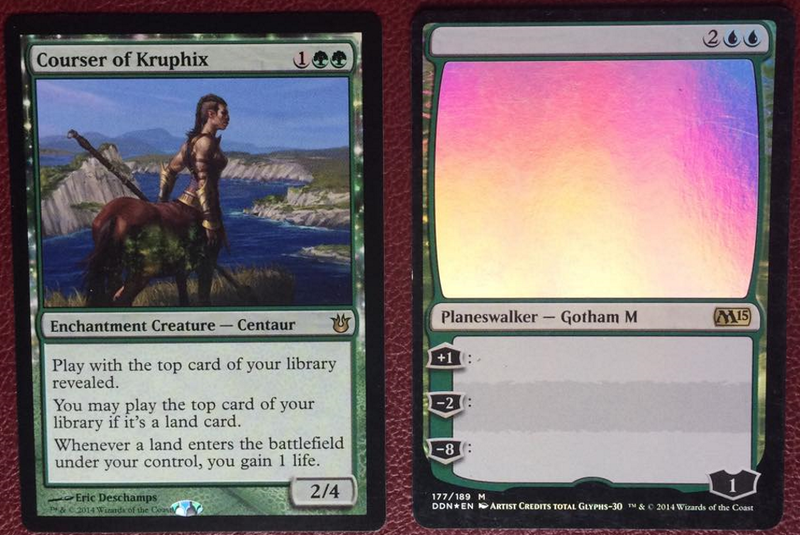 Unlimited rare card on one side, Antiquities card + Unlimited common on other side: Misprint. 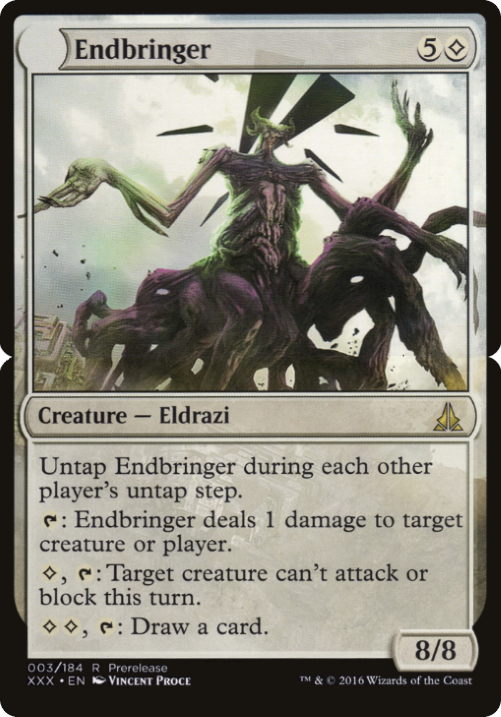 I'd say misprint as a WotC designer can't use these cards to determine the acceptability of a new design or process because of the poor quality. To investigate a new design, a clean card would be manufactured, such as those used to determine the best layout for the "new" card face. 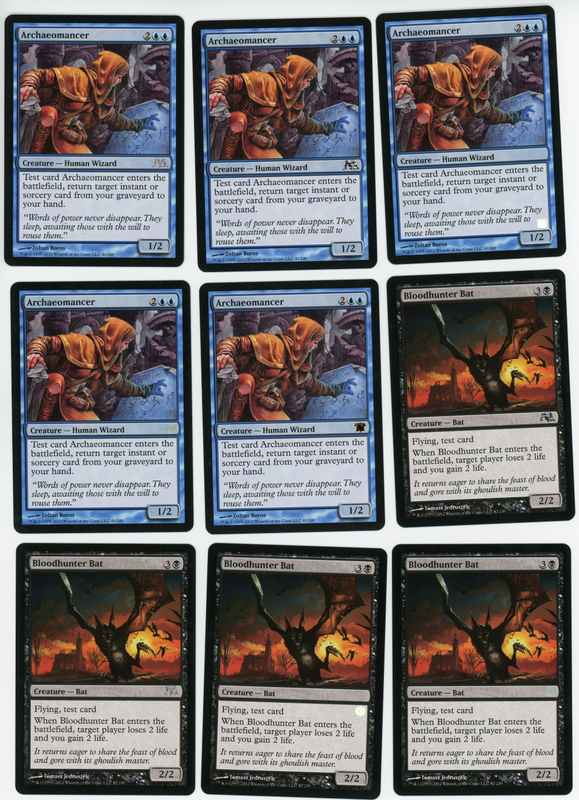 Misprinted Non-Standard Error Cards section: All misprints. None of these were intentionally made to assess a design or print process. All were unintended omissions of the date symbol, extra date symbol, misplaced date, etc. 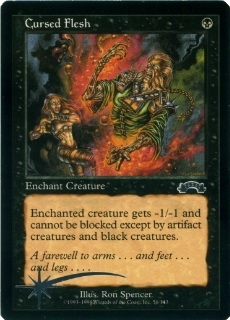 A Fleetfoot Panther with a date stamp is also a misprint. 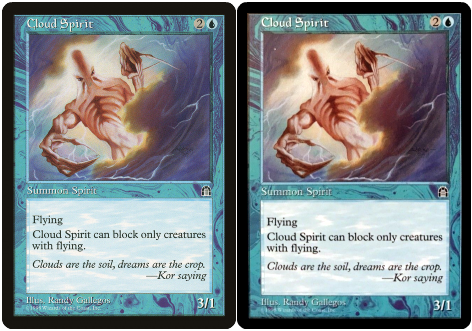 From Daniel Gelon (graphic designer for that project): Around the time of Unglued we had toyed with the idea of changing the card face. 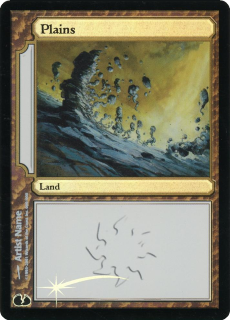 Mainly to make land in a hand easier to read. 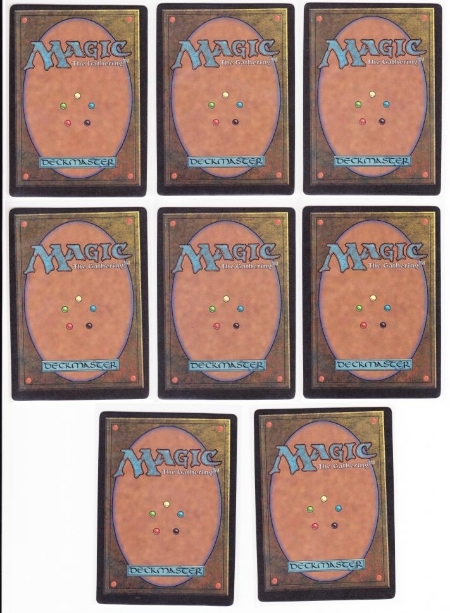 They were not supposed to be the official card faces for any set (not 8th). It was an internal thought experiment that was rejected. 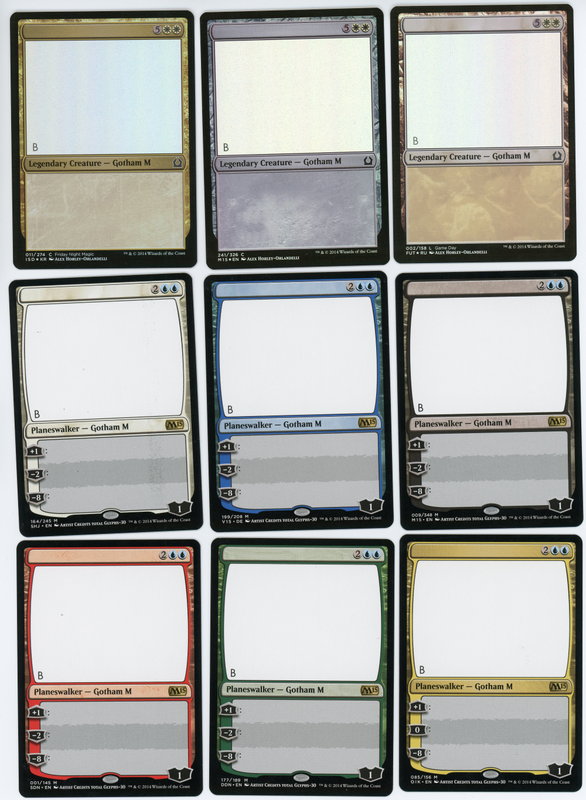 Here are the 2 press proof sheets I have non foil- complete with comment marks. 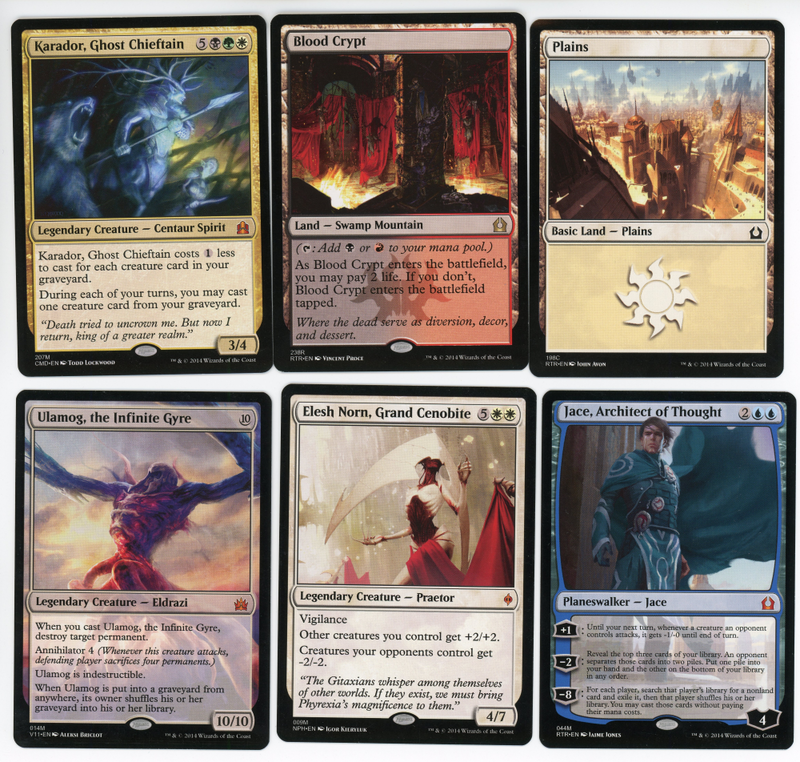 Illustrations that were used on the cards are from Common, Uncommon and Rare Visions (VIS), Tempest (TMP), Nemesis (NMS) and Prophecy cards (PCY), the 5 basic lands are from Mercadian Masques (MMQ). It is not known when that project was done precisely but it was after June 2000. 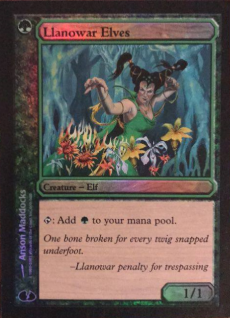 A foil Llanowar Elves with the illustration of Harvest Mage from Nemesis, text and flavor text from Llanowar Elves (6th Edition or Beatdown) exists with square cut corners, the text box is not foil and with white back. 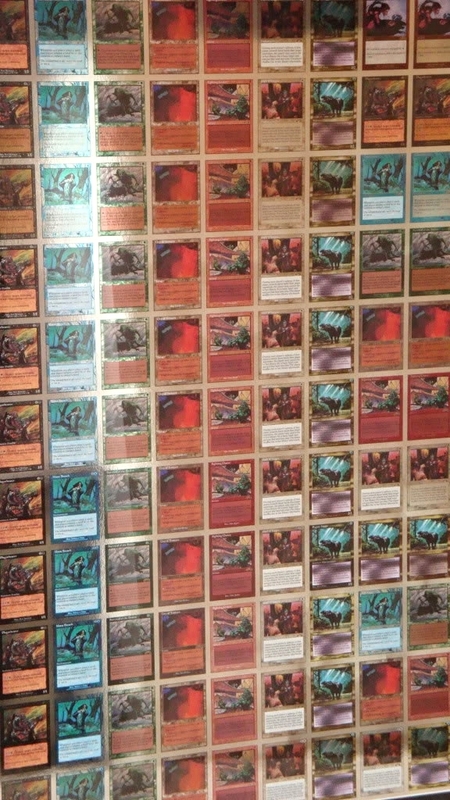 It is not known if the foil sheets still exist. 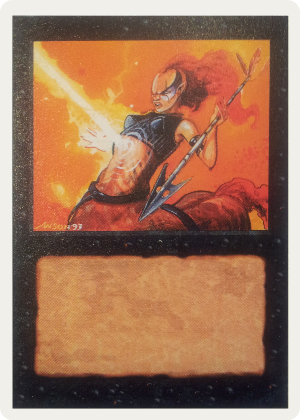 Foil Llanowar Elves with the illustration of Harvest Mage from Nemesis front and back. 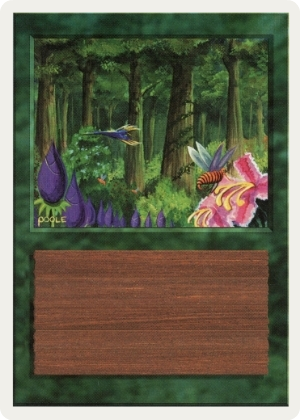 Ebon Stronghold with illustration of Jungle Basin from Visions illustrated by John Avon. 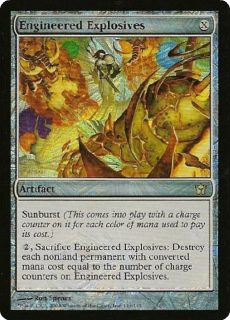 Text Ebon Stronghold from Beatdown. 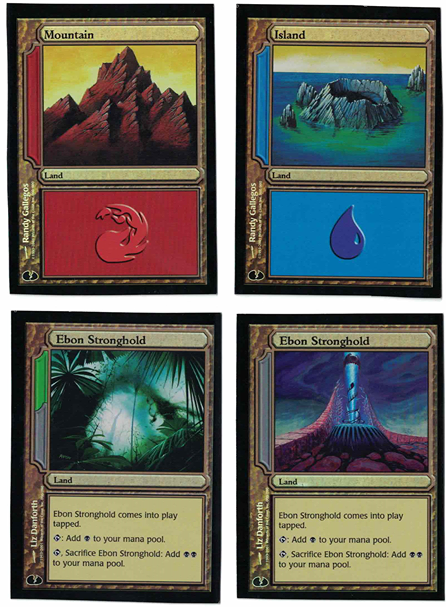 Ebon Stronghold with illustration of Terrain Generator from Nemesis illustrated by Alan Pollack. 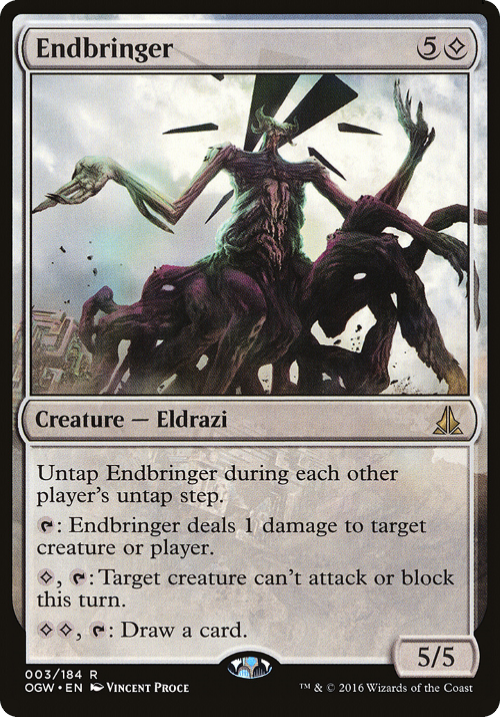 Text Ebon Stronghold from Beatdown. 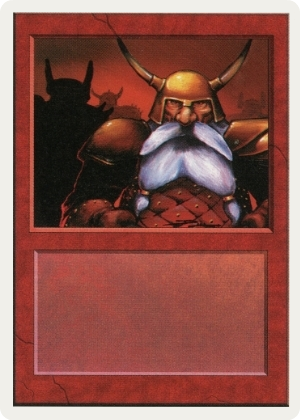 Rath's Edge from Nemesis illustrated by Ron Spencer. 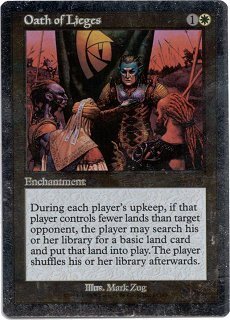 Text Ebon Stronghold from Beatdown. One of the Non-foil Complete Press proof sheets with Unglued symbol and comment marks. White back. 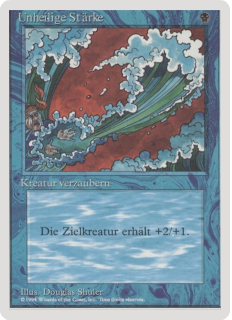 *R Static Orb - From 7Th Edition . 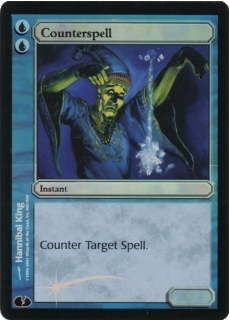 Wrong Judgement rarity symbol was used: Common instead of Rare. *U Flash of Insight - From Judgement. 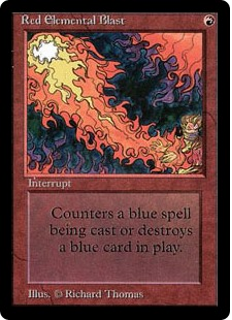 Wrong Judgement rarity symbol was used: Common instead of Uncommon. 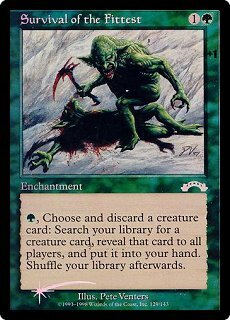 R Nantuko Shade - From Torment. The diacritic mark tilde has been omitted on the "o", it should be: Brian Snõddy. 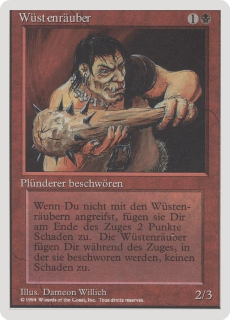 *C Volcanic Hammer - From 7Th Edition. 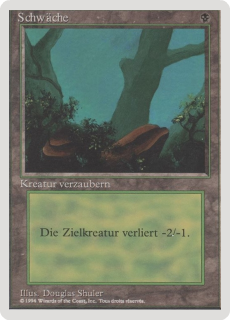 Wrong Judgement rarity symbol was used: Uncommon instead of Common. *R Sulfurous Springs - From 7Th Edition. Wrong Judgement rarity symbol was used: Common instead of Rare. 56 cards with 2 variations = 112 cards. 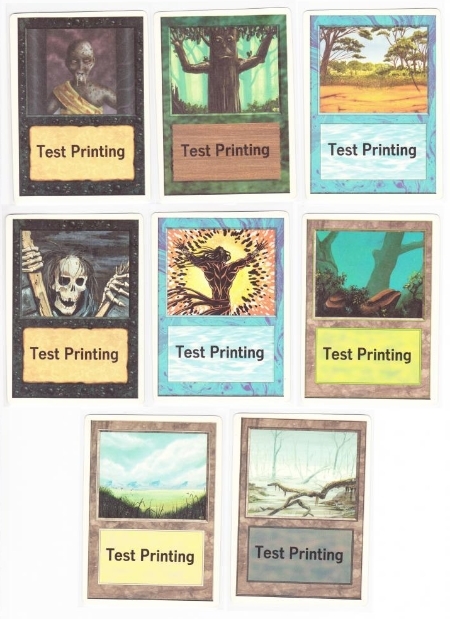 Multiple Test Prints of each cards exist. 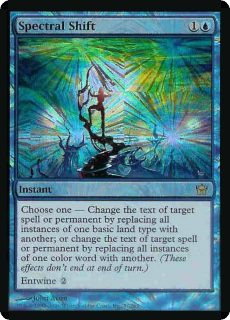 They printed 4 of each card: 2 Non-foil (Bright and Dark) and 2 different foil versions: Bright with non-foil picture/textbox and Dark with foil all over the card. 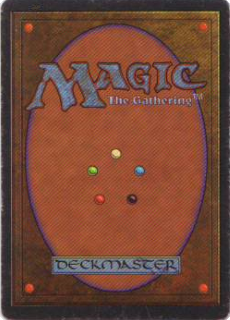 The Unglued symbol was used for this serie and all the artists are on the left side. 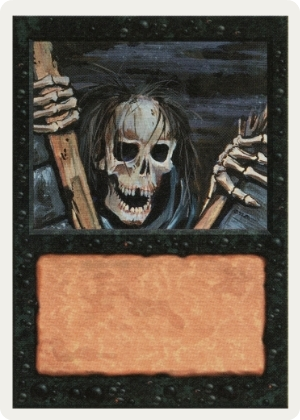 The cards have the Unglued Symbol only in black, they only exist with white back. 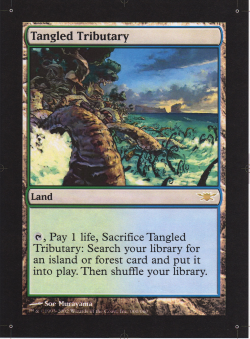 All the Basic-Lands (Forest, Island, Mountain, Plains and Swamp) have the same picture of Parrallax Tide (Rare blue card from Nemesis). 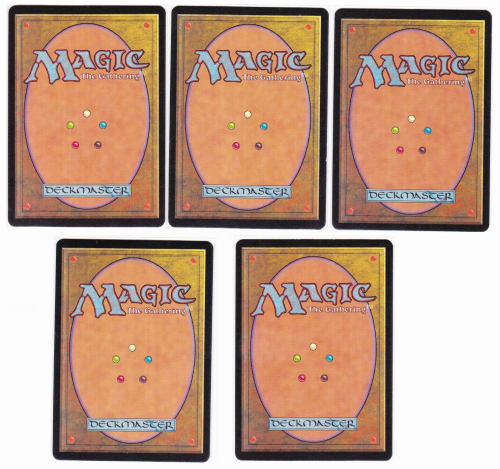 Those with the Unglued symbols were never actually playtested, just created as prototypes. The Unglued symbol ones are thicker and print quality is better than the Judgment ones. 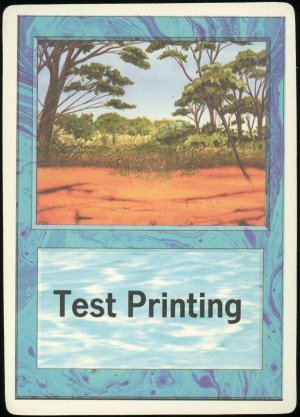 It is not known of how many sheets were cut and test prints cards are available exactly. 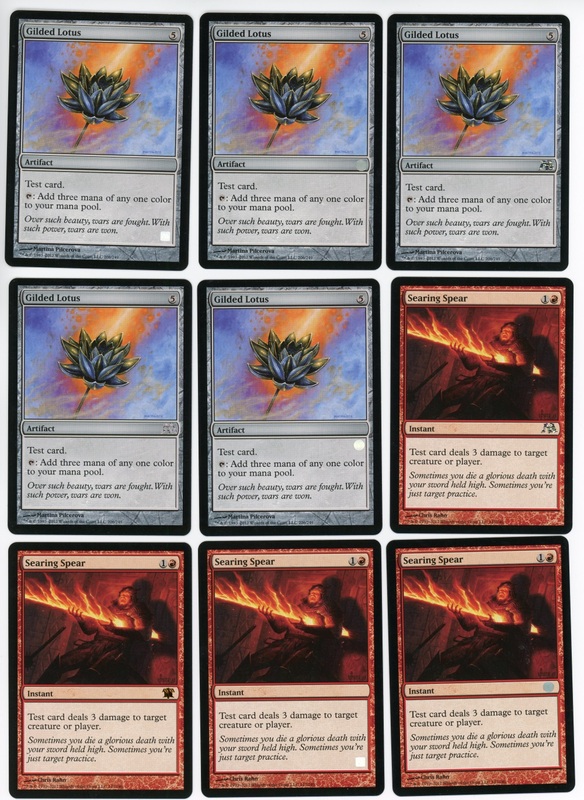 48 different cards with 2 variations. 96 cards + 14 extra cards for a total of 110 cards. Printing Company: PBM Graphics (North Carolina, United States). Labeled as: Magic 8th Ed. Test #3. 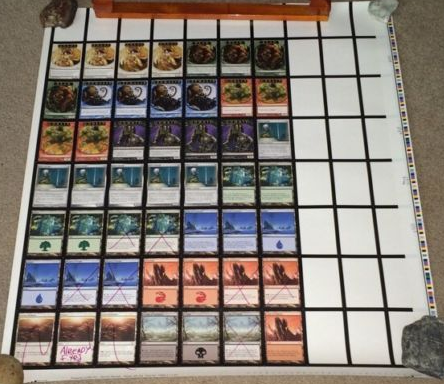 11 X 10 sheet: 64 cards and 46 Black Border Filler Cards (110 cards). 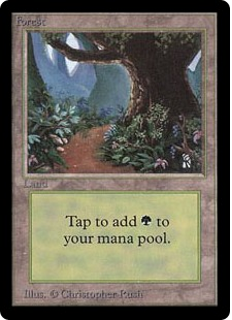 Name of cards used: Some exist (Silver Seraph, Field of Dreams, etc. 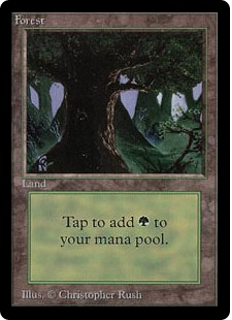 ), others don't (Forest of Doom, Cliffs of Insanity, Shore of Confusion, etc.). 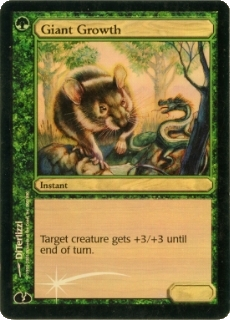 Symbol used: Rare symbol Legions. 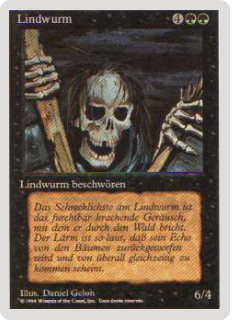 Copyright line: ™ & ©1993-2002 Wizards of the Coast, Inc. 000/000. 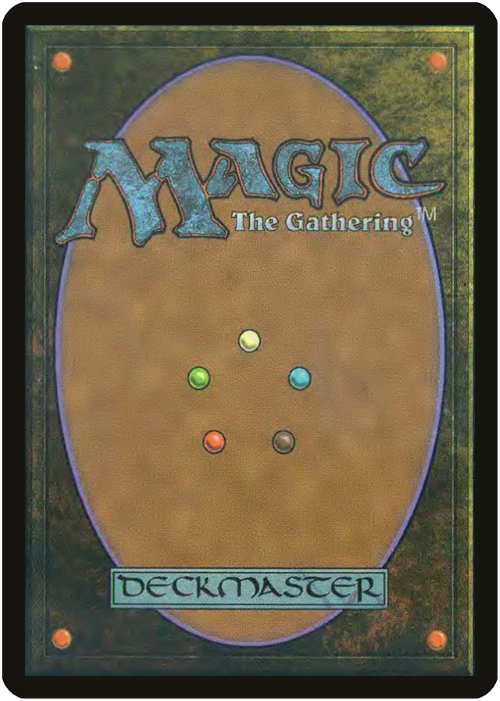 Illustrator's names used: Not actual artist but are WotC employees or ex-WotC employees, examples: Chel Bieze (Typesetter), Beth Evesong (? ), Richard Garfield (Creator/Designer/Developer), Chuck Huebner (Senior Vice President in charge of Strategic Planning/President of WotC), Chris Nitz (Senior Prepress Systems Analyst), Bill Rose (Magic Playtester/Developer/Designer), David Serra (Translator), etc. 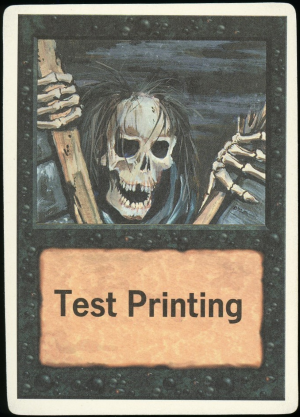 Individual test prints are supposed to exist (to be proven). 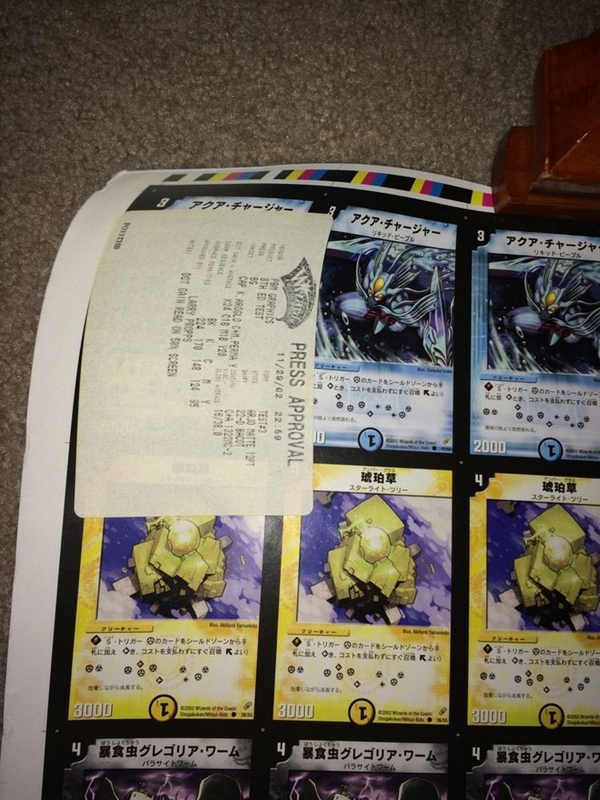 Row 1: 3 Japanese Aqua Jolter Duel Masters cards, and 7 Black Border Filler Cards. 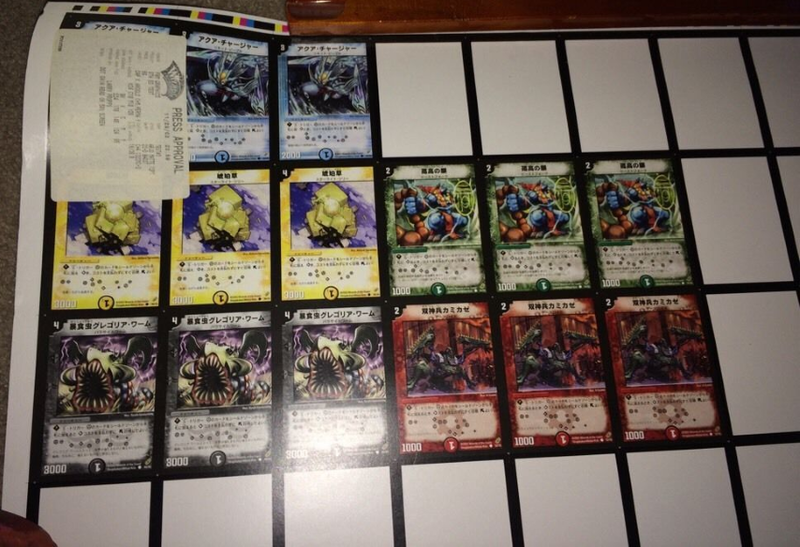 Row 2: 3 Japanese Amber Grass Duel Masters cards, 3 Japanese Torcon Duel Masters cards and 4 Black Border Filler Cards. 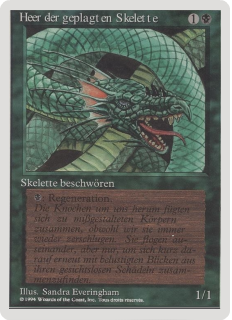 Row 3: 3 Japanese Gregorian Worm Duel Masters cards, 3 Japanese Kamikaze, Chainsaw Warrior Duel Masters cards and 4 Black Border Filler Cards. 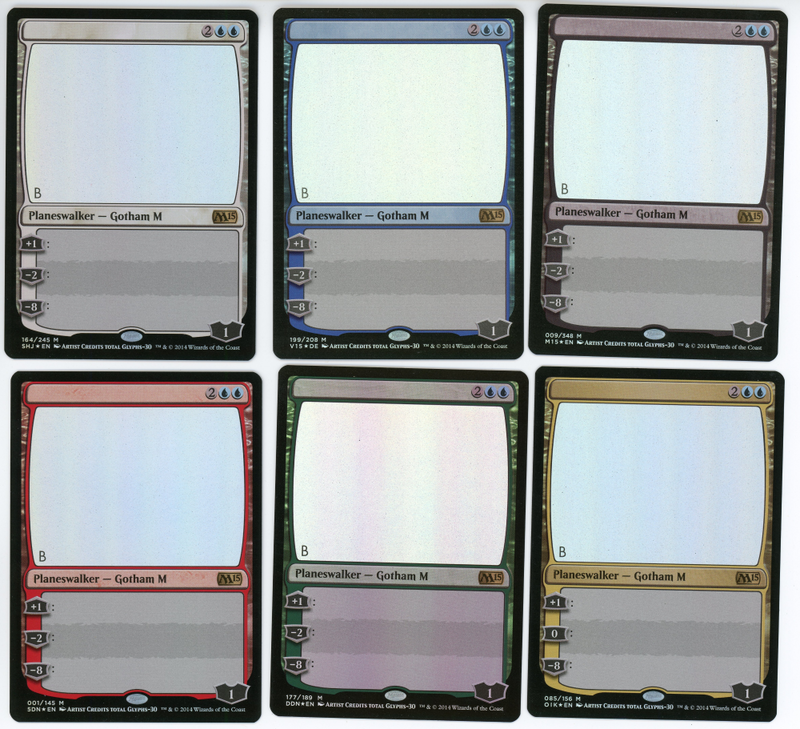 Row 4: 10 Black Border Filler cards. Row 5: 2 Angel Cards Tokens (illustration Akroma, Angel of Wrath from Legions), 2 Angel full-art Tokens (illustration Akroma, Angel of Wrath from Legions) , 2 Bear cards Tokens (illustration MPR from Legions), 1 Bear full-art Token (illustration MPR from Legions) and 3 Black Border Filler Cards. 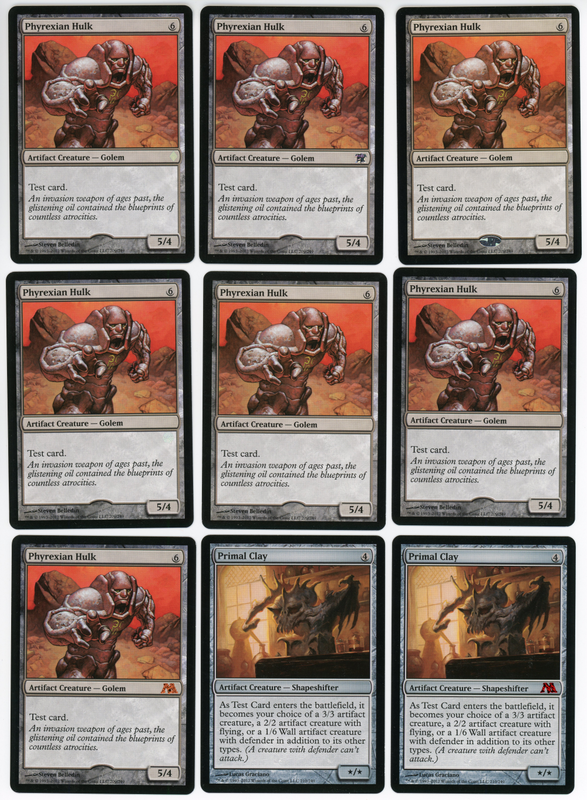 Row 6: 1 Bear full-art Token (illustration MPR from Legions), 2 Cephalid cards Tokens (illustration Aboshan, Cephalid Emperor from Judgment), 2 Cephalid full-art Tokens (illustration Aboshan, Cephalid Emperor from Judgment), 2 Goblin cards Tokens (illustration Goblin Goon from Legions) and 3 Black Border Filler Cards. Row 7: 2 Goblin full-art Tokens (illustration Goblin Goon from Legions), 2 Zombie cards Tokens (illustration Magic Online Token from Onslaught), 2 Zombie full-art Tokens (illustration Magic Online Token from Onslaught), 1 Silver Seraph card (illustration Mirari card from Odyssey) and 3 Black Border Filler cards. Row 8: 5 Silver Seraph cards (illustration Mirari from Odyssey), 2 Forest of Confusion (illustration Forest 347/350 from Onslaught) and 3 Black Border Filler Cards. 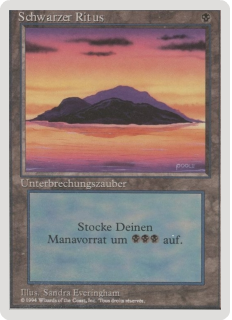 Row 10: 1 Island card (illustration Island 336/350 from Invasion), 2 Waves of Delight cards (illustration Island 336/350 from Invasion), 2 Mountain cards (illustration Mountain 340/350 from 7Th Edition), 2 Ciffs of Insanity cards (illustration Mountain 340/350 from 7Th Edition) and 3 Black Border Filler cards. 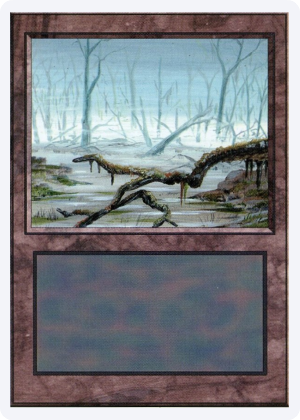 Row 11: 1 Sunset of Doom card (illustration Plains 331/350 from Invasion), 1 Plains card (illustration Plains 331/350 from Invasion), 1 Field of Dreams card (illustration Plains 331/350 from Invasion), 1 Swamp of Confusion card (illustration Swamp 342/350 from Onslaught), 1 Swamp card (illustration Swamp 342/350 from Onslaught), 1 Swamp of Dispair card (illustration Swamp 342/350 from Onslaught), 1 Peak of Dispair card (illustration Mountain 340/350 from 7Th Edition) and 3 Black Border Filler cards. Cliffs of Insanity is a reference to the 1987 movie The Princess Bride. Forest of Doom is a reference to the single-player adventure gamebook written by Ian Livingstone in 1983. It was later republished by Wizard Books in 2002. 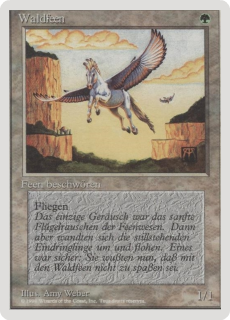 Flavor text for Angel card Token is from Serra Angel (Beta-Fourth Edition). 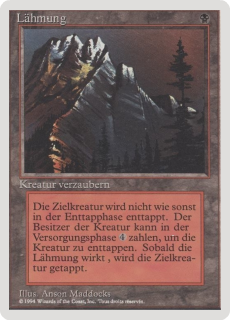 Flavor text for Bear card Token is from Grizzly Bears (Alpha-Sixth Edition). 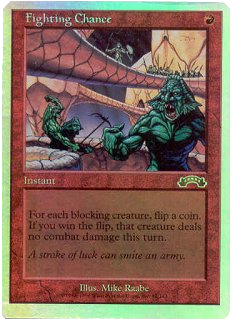 Flavor text for Cephalid card Token is from Cephalid Looter (Odyssey). 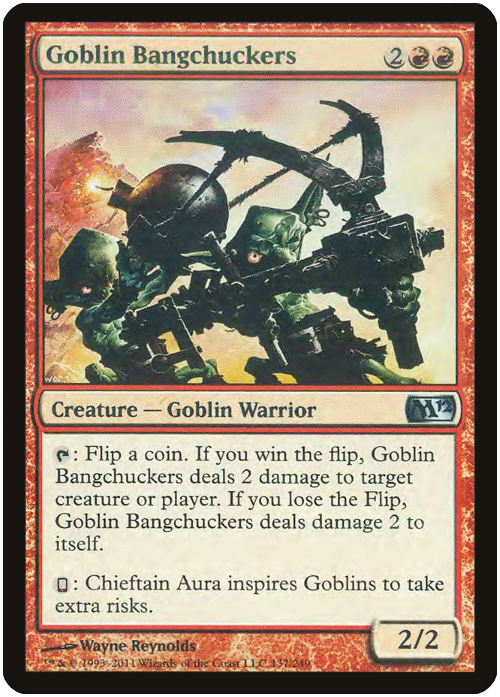 Flavor text for Goblin card Token is from ? 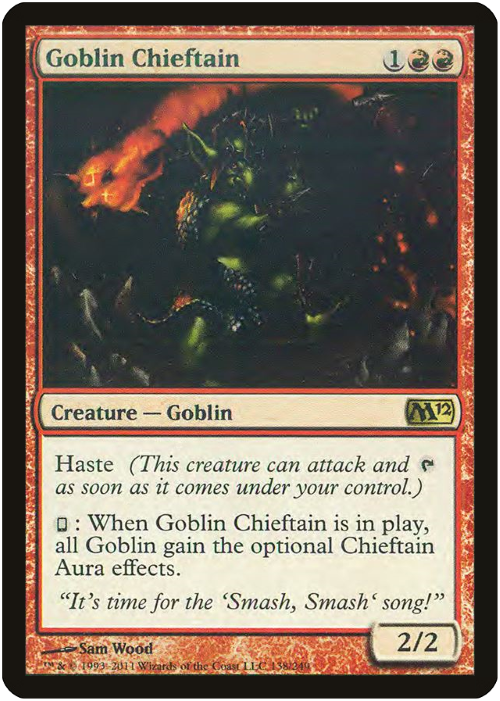 Flavor text for Silver Seraph is from Goblin Turncoat (Legions). 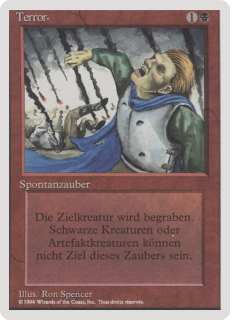 Flavor text for Zombie card Token is from Shepherd of Rot (Onslaught). 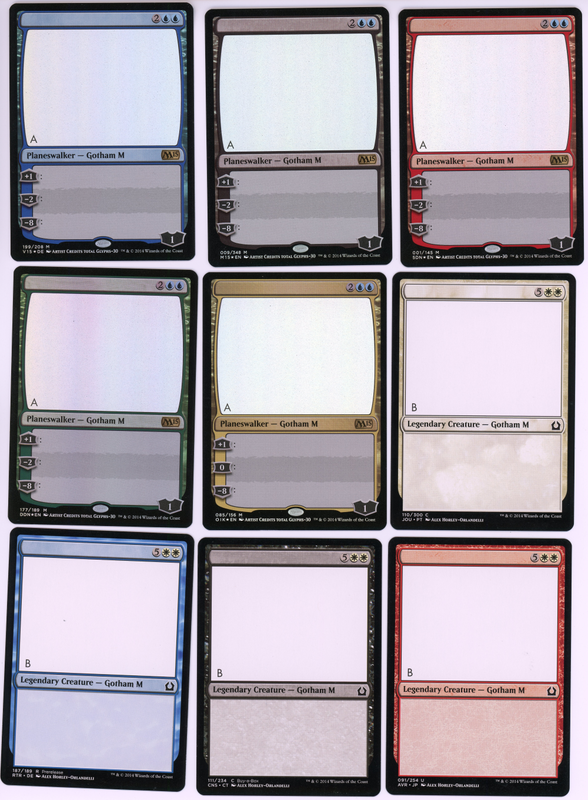 8Th Edition Uncut Test Press approval sheet without Duel Masters cards. 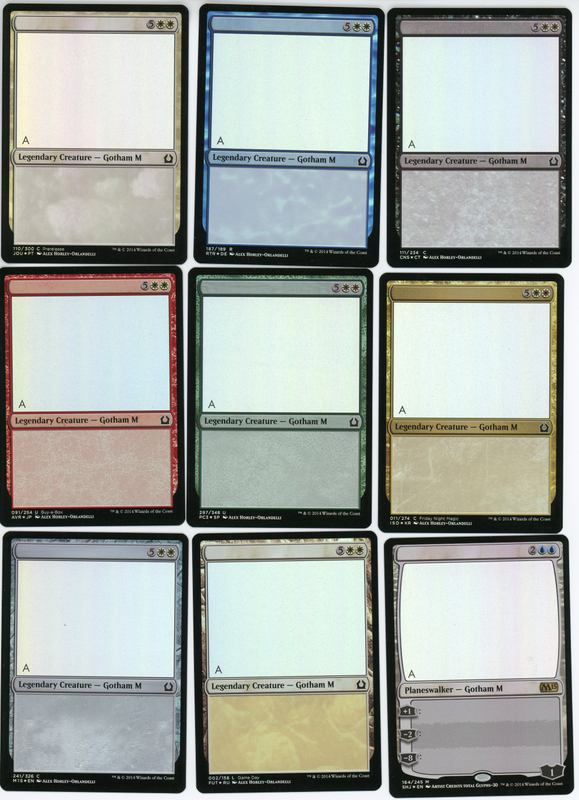 8 X 10 sheet: : 49 cards and 31 Black Border Filler Cards (80 cards). 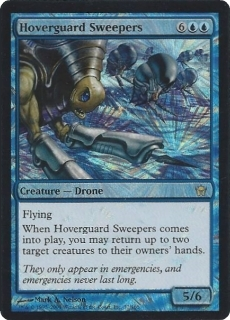 Name of cards used: Some exist (Silver Seraph, Field of Dreams, etc. 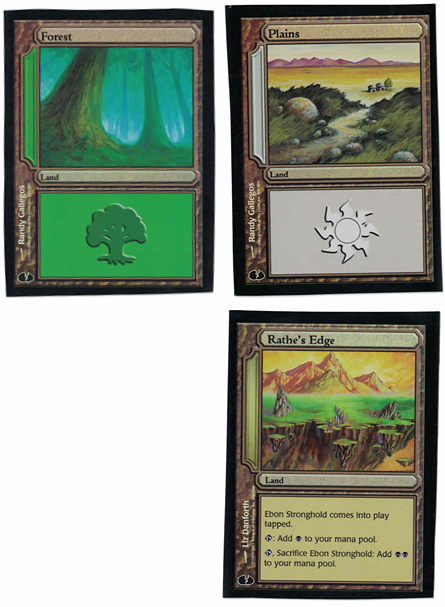 ), others don't (Cliffs of Insanity, Forest of Doom, Swamp of Confusion, Waves of Delight, etc.). Chel Bieze: Typesetter credited for Forest. 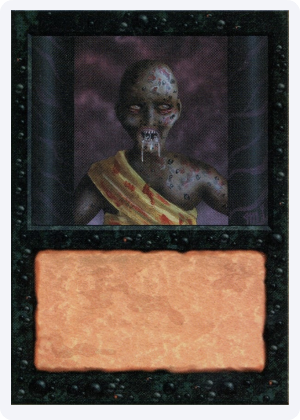 Jeremy Cranford: Art Director credited for Zombie full-art Token. Beth Evesong: ? credited for Waves of Delight. 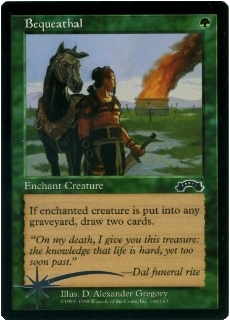 Richard Garfield: Creator/Designer/Developer credited for Field of Dreams. 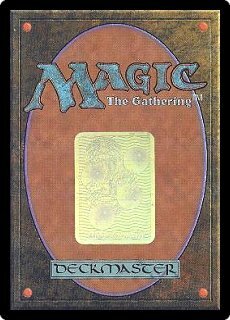 Chuck Huebner: Senior Vice President in charge of Strategic Planning/President of WotC credited for Angel card Token (with flavor text). 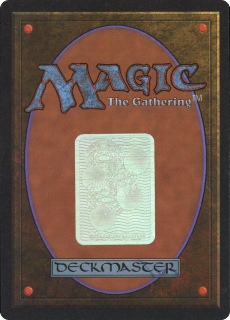 Jessica Kristine: Editor of Duelmasters and the Star Wars TCG credited for Silver Seraph. Bill LeDrew: Database Administrator credited for Silver Seraph. 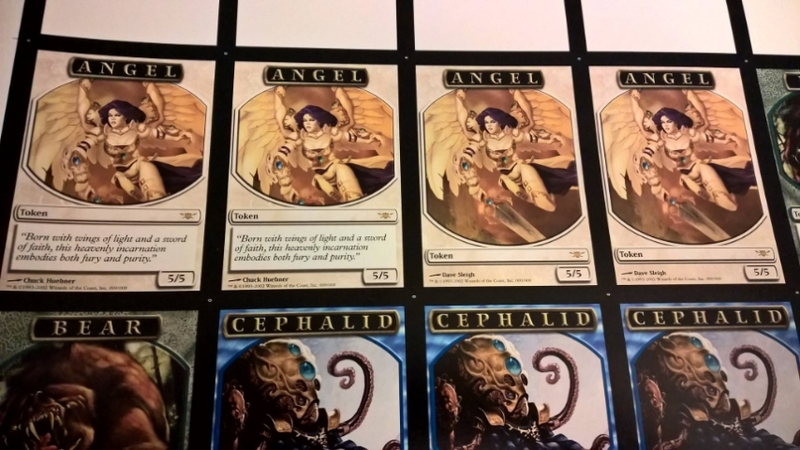 Bill McQuillan: Senior Editor credited for Cephalid full-art Token. Steve Nashem: Graphic Production credited for Forest of Doom. Chris Nitz: Senior Prepress Systems Analyst credited for Swamp of Confusion. Patrick Robinett: Senior Planning Manager credited for Cliffs of Insanity. 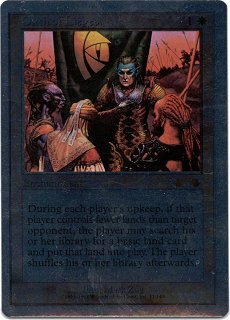 Bill Rose: Magic Playtester/Developer/Designer credited for Plains. David Serra: Translator credited for Island. 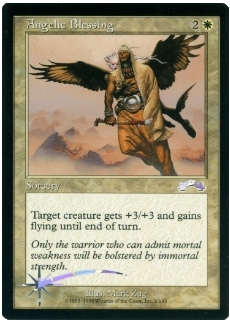 Dave Sleigh: Software Engineer II credited for Angel full-art Token. 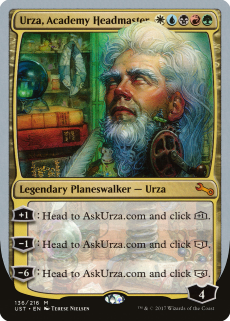 Bryan Zembruski: Customer Service Representative credited for Bear card Token (with flavor text). 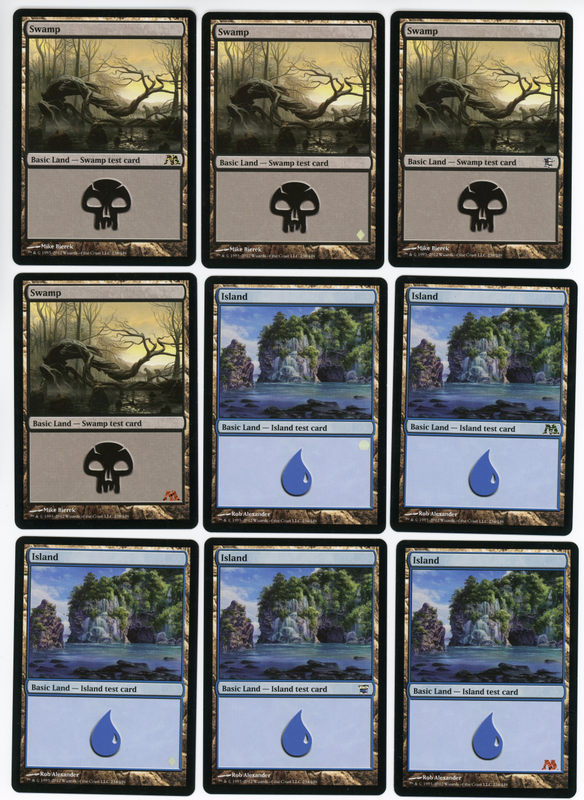 Row 1: 10 Black Border Filler cards. Row 2: 2 Angel Cards Tokens (illustration Akroma, Angel of Wrath from Legions), 2 Angel full-art Tokens (illustration Angel of Wrath from Legions), 2 Bear cards Tokens (illustration MPR from Legions), 1 Bear full-art Token (illustration MPR from Legions) and 3 Black Border Filler Cards. 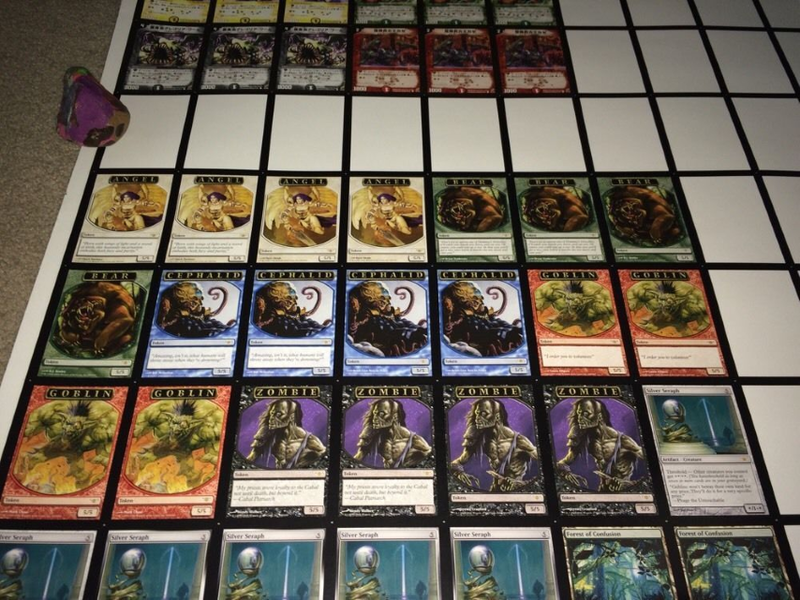 Row 3: 1 Bear full-art Token (illustration MPR from Legions), 2 Cephalid cards Tokens (illustration Aboshan, Cephalid Emperor from Judgment), 2 Cephalid full-art Tokens (illustration Cephalid Emperor from Judgment), 2 Goblin cards Tokens (illustration Goblin Goon from Legions) and 3 Black Border Filler Cards. Row 4: 2 Goblin full-art Tokens (illustration Goblin Goon from Legions), 2 Zombie cards Tokens (illustration Magic Online Token from Onslaught), 2 Zombie full-art Tokens (illustration Magic Online Token from Onslaught), 1 Silver Seraph card (illustration Mirari from Odyssey) and 3 Filler cards. 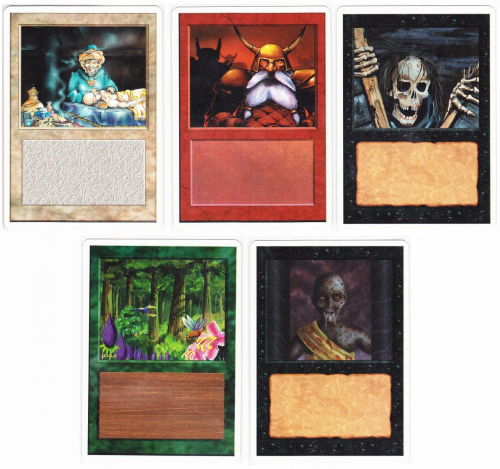 Row 5: 5 Silver Seraph cards (illustration Mirari from Odyssey), 2 Forest of Confusion cards (illustration Forest 347/350 from Onslaught) and 3 Black Border Filler Cards. 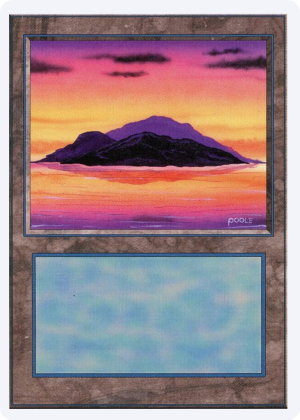 Row 7: 1 Island card (illustration Island 336/350 from Invasion), 2 Waves of Delight cards (illustration Island 336/350 from Invasion), 2 Mountain cards (illustration Mountain 340/350 from 7Th Edition), 2 Cliffs of Insanity cards (illustration Mountain 340/350 from 7Th Edition) and 3 Black Border Filler cards. 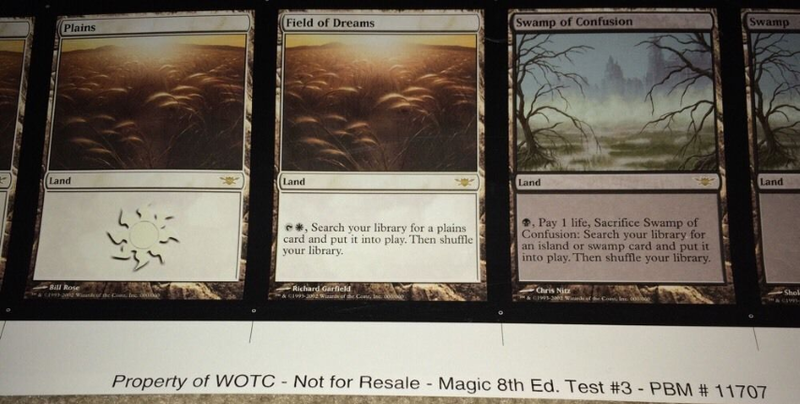 Row 8: 1 Sunset of Doom card (illustration Plains 331/350 from Invasion), 1 Plains card (illustration Plains 331/350 from Invasion), 1 Field of Dreams card (illustration Plains 331/350 from Invasion), 1 Swamp of Confusion card (illustration Swamp 342/350 from Onslaught), 1 Swamp card (illustration Swamp 342/350 from Onslaught), 1 Swamp of Despair card (illustration Swamp 342/350 from Onslaught), 1 Peaks of Dispair card (illustration Mountain 340/350 from 7Th Edition)and 3 Black Border Filler cards. Measurements: 5.1/2' x 7.3/8' (12.954 cm x 18.542). 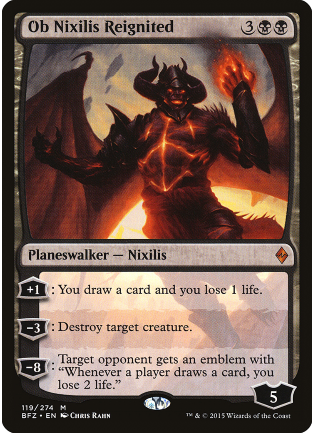 Back: Printed at WotC on white letter-sized paper and on a regular printer. 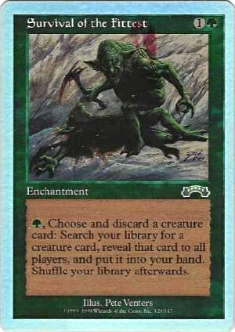 Name of cards used: Don't exist. Illustration used: Apocalypse, Odyssey, Judgment. Illustrator's names used: Not actual artist, but are WotC employees or ex-WotC employees. 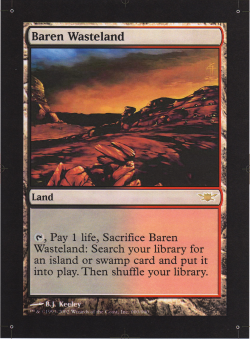 Baren Wasteland (illustration Shadowblood Ridge from Odyssey)- Artist B.J. Keeley - Quality Assurance Proofer. Cauldron and Anvil (illustration Battlefield Forge from Apocalypse)- Artist Nancy Herring - Quality Assurance. Cauldron of Confusion (illustration Battlefield Forge from Apocalypse)- Artist Mike Elliot - Game Designer (lead). Cave of Tommorrow (illustration Darkwater Catacombs from Odyssey)- Artist Carmen Cheung - Graphic Production Specialist. Clash of the Elements (illustration Shivan Reef from Apocalypse)- Artist Hanno Girke - Game Designer. Eye of the Overseer (illustration Caves of Koilos from Apocalypse)- Artist Jennifer Wood - Localization Project Manager. Lost Vortex (illustration Riftstone Portal from Judgement)- Artist Dana Knutson - Art Director. 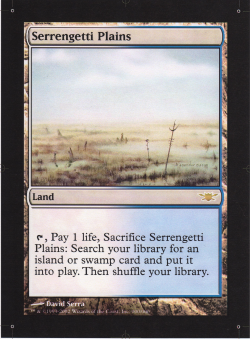 Serrengetti Plains (illustration Skycloud Expanse from Odyssey)- Artist David Serra - Manager of Localization Services. Tangled Tributary (illustration Yavimaya Coast from Apocalypse)- Artist Soe Murayama - Graphic Designer/Illustrator. 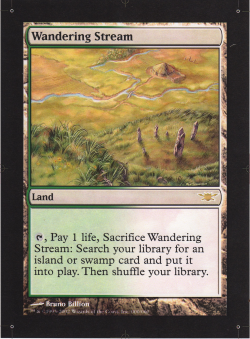 Wandering Stream (illustration Sungrass Prairie from Odyssey)- Artist Bruno Billion - Technical Translator. Watchposts of the Lochnar (illustration Mossfire Valley from Odyssey)- Artist Randy Buehler - Director of Magic R&D. Serrengetti Plains is a reference to a region of Africa located in north Tanzania and that extends to southwestern Kenya. Name, which is derived from the Maasai language and means "endless plains.". 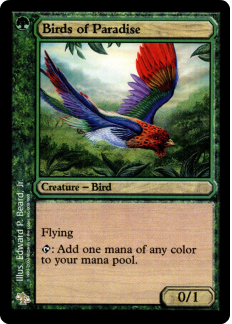 Wandering Stream is the name of a Common Green card from Invasion illustrated by Quinton Hoover. 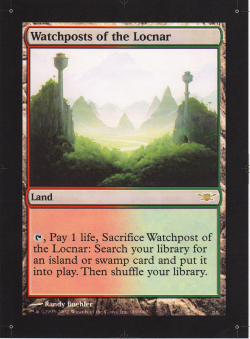 Watchposts of the Locnar is a reference to the 1981 movie Heavy Metal. 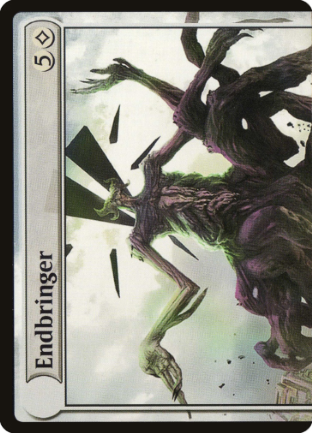 Standard Endbringer from Oath of Gatewatch Vs Endbringer "Meld" Test Print. 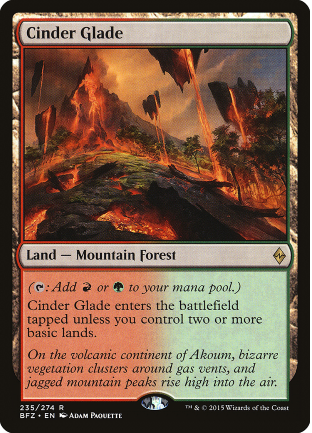 Cinder Glade and Ob Nixilis Reignited Front from Battle of Zendikar and Endbringer back. 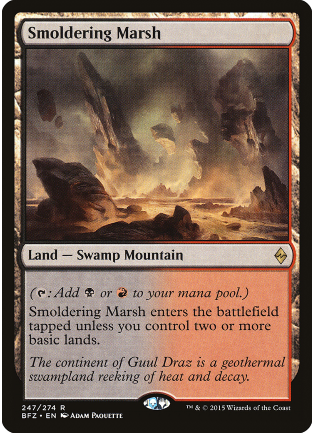 Prairie Stream and Smoldering Marsh Front from Battle of Zendikar and Endbringer back. 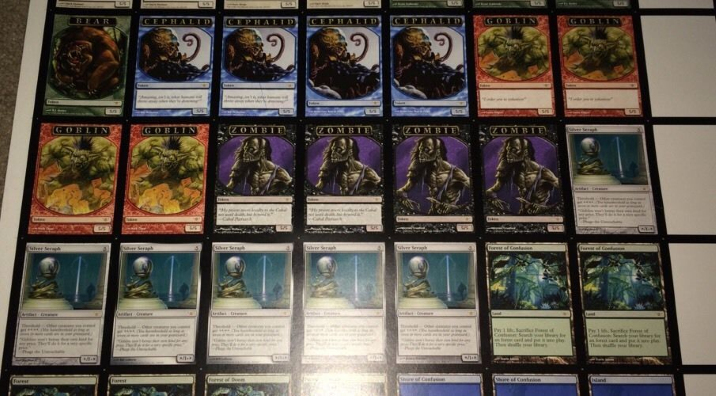 Aside from the foil project cards, few other test prints have been leaked into the public. 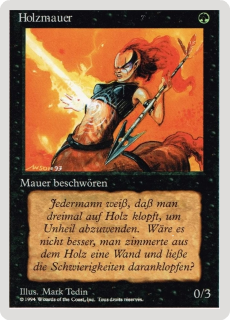 There is a Beta Lightning Bolt and Hurloon Minotaur which feature a soft and flexible hologram professionally embedded into the backside of the card apparently by using pressure, similar to how the new holofoil ovals are done. On most of the cards, the outline of the hologram is visible on the card face, this would be a side effect of the pressure used to apply the hologram and it was installed after the cards were printed by Carta Mundi (Not a WotC Product). The text on the hologram says High Gloss Glossogram. 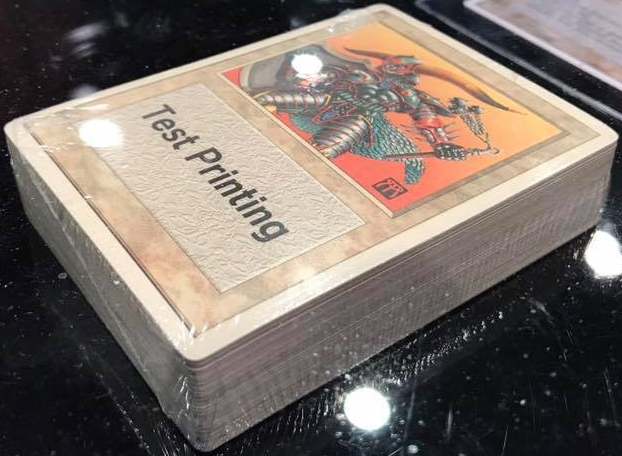 The precised purpose of that Hologram test print that was supposedly commissioned by WotC, and offered by a third party is not known, maybe an anti-counterfeiting measure (according to my source). They were created by a Dutch company named High Gloss based in Doetinchem, The Netherlands, that is specialized in laminating, foil printing, embossing, punching and creasing since 1992. The precised year it was done is not known at the moment. 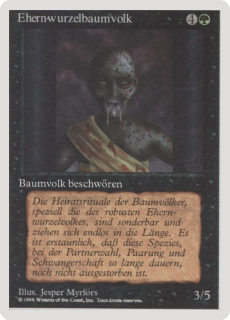 9 Common cards were Test printed from Exodus, before the other series (Oath of Lieges, etc.). 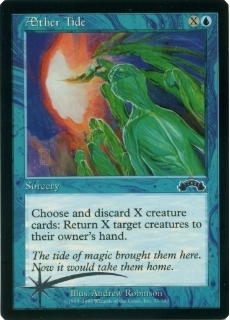 A double Exodus symbol exist on all the cards. The original black symbol and a silver one over it. All the cards have regular MTG back. Star and Exodus symbol with holographic treatment, appearing as a pattern of crystalline triangles (different triangles). Star and Exodus symbol in silver with no holographic treatment. 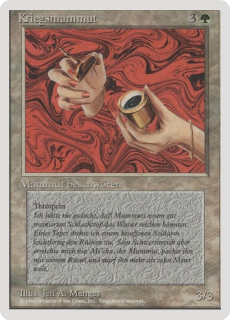 Back in 1998, Wizards of the Coast was experimenting on a way to increase the attractiveness of Magic cards by applying a foil layer on their front side. 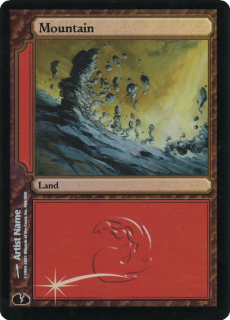 For this reason, one card from each color template was selected from the latest Magic set, Exodus, and a series of test prints were issued. 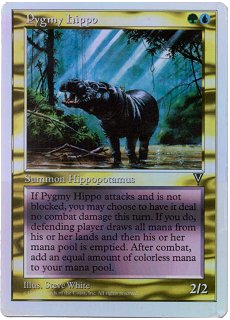 Due to the absence of multicolored cards in Exodus, one additional card, Pygmy Hippo, was added from another set, Visions. The test prints feature different grades of intensity of the foil layer and vary set symbols and the shooting star symbol to cover the whole spectrum of possible templates. Inside the 4 variations, 9 different grades of brightness exist. 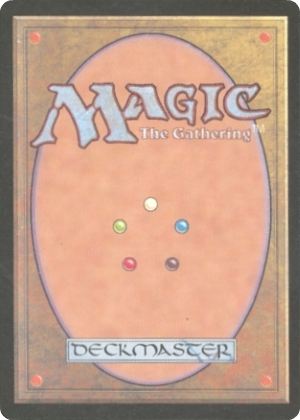 All the cards have the original Symbol. All the cards have regular MTG back. 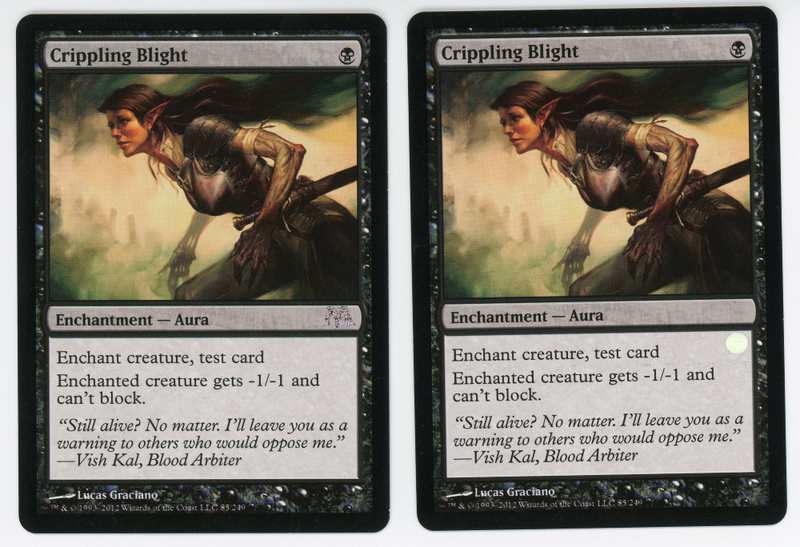 Inside the 3 variations, different grades of brightness exist. All the cards have regular MTG back. 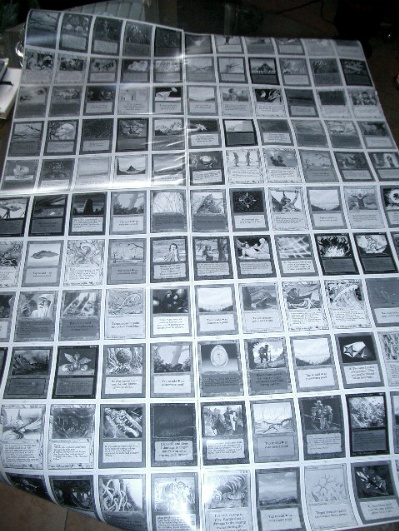 Two Foil Exodus Test Prints uncut sheets Black Border without Star and with white backs were sold to private collectors, they differ from the others. One of the owner did have the sheet cut (NFC) in order to sell the Test Prints individually. This info is added in this index only for historical reasons. The foiling process on the one I have is quite a bit different from the other sheet, though I believe everything else is the same. The foiling on my sheet looks more like a "camouflage" foil as opposed to the other one. I wanted to add some details about the foil sheet for the index, since it's much cooler than what I had originally thought. 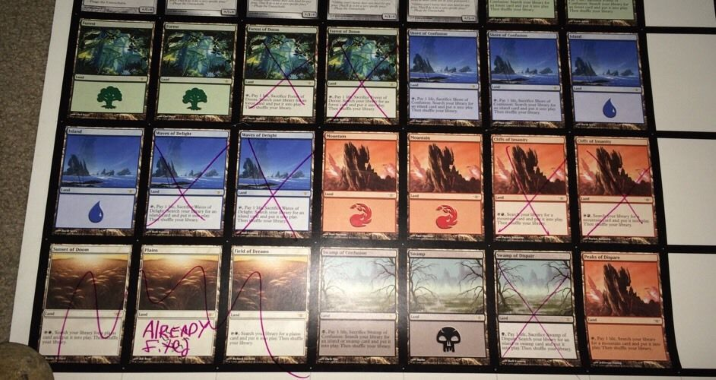 I can't verify if the other sheet is exactly like this or not, but I know who bought it and will contact him to ask. 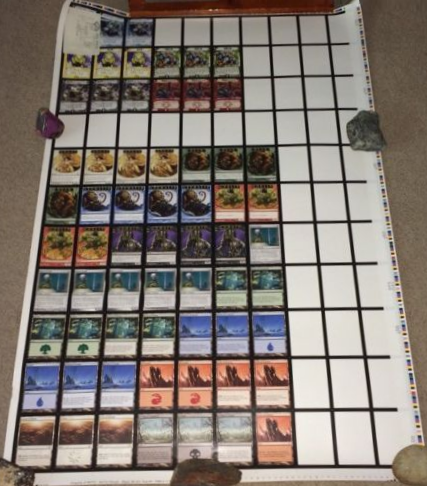 When I originally started looking to buy the sheet, I thought each card on the sheet was the exact same (so 9 of the same City, 9 of the same Survival, etc.). 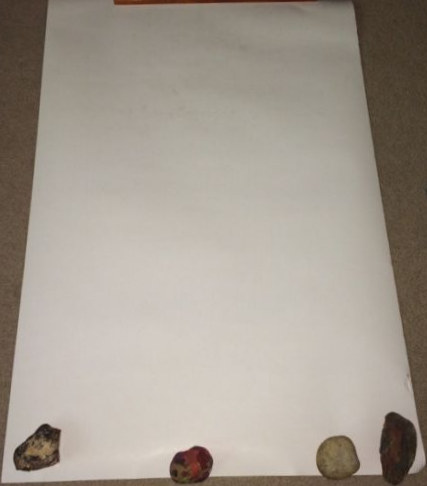 To my surprise, they are all unique and no two are the same! I've never seen an uncut test print sheet, so I didn't know that's how they printed them. There are 9 rows on the sheet and I'm going to describe the details row by row (starting from the top). The first descriptor is the number in the right margin. Hopefully someone can help me, as I'm not 100% sure what that means. 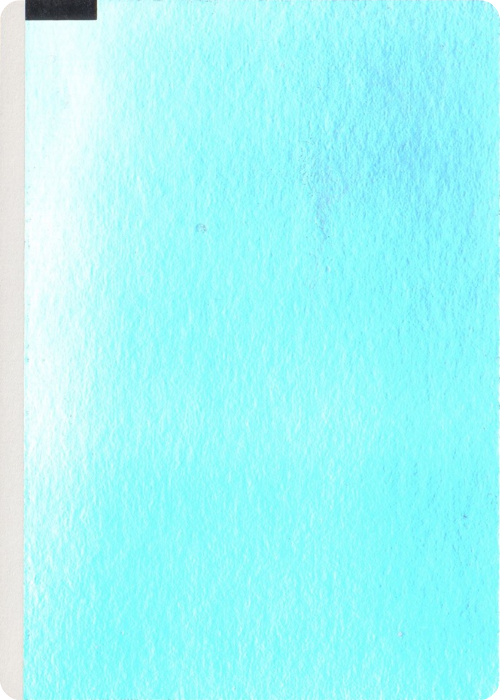 Is it just the saturation of the ink, or does it describe certain colors being more prevalent? The +1 appears to be darker than the -1, but I couldn't tell any differences in colors being missing, etc. 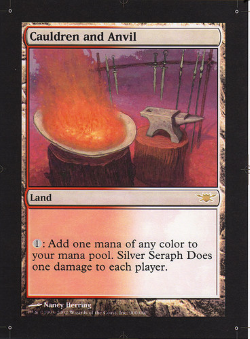 The second descriptor is about how much foil is on the card. The sheet is broken down into 3x rows of "+1" darkness, 3x rows of "-1" darkness, and 3x rows of "1" darkness. 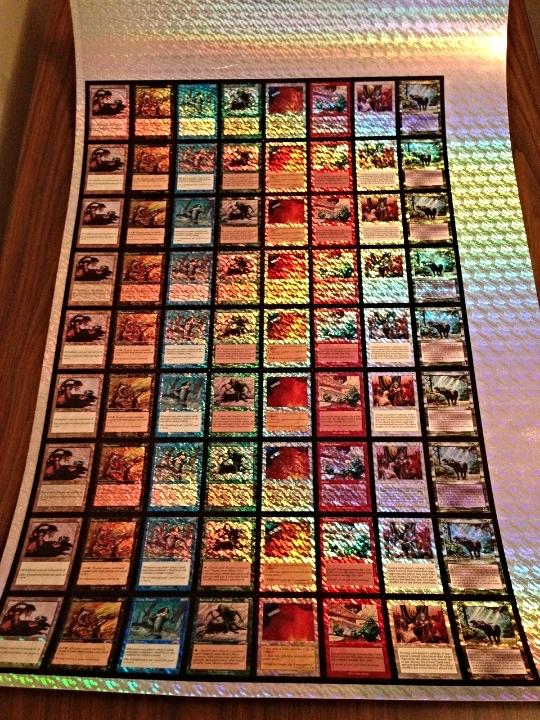 Each of those 3 rows have a different foiling process on them. They either have foil everywhere, foil everywhere except the text box, or foil everywhere except the text box and picture box. The third descriptor is whether or not the cards have a set symbol. The first 4 rows on the sheet do not have symbols, while the bottom 5 do. I found it very odd that they didn't do either 3 or 6 with the symbol and instead only did 5. Those are the main differences in each row. However, there is one extra different that makes on the rows unique from the other eight. 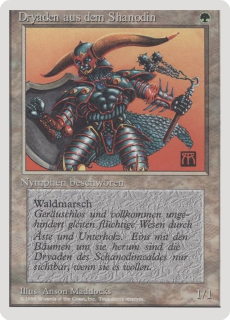 All the rows have white ink for all the text not in the text box (name, card type, power/toughness, artist name and copyright), except row 3. Row 3 has no white ink in those places, so all that text is foil instead. It looks extremely awesome and I'm not sure why they only tested one row this way. 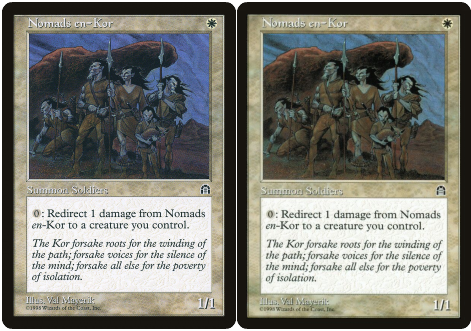 Row 3: +1 , no foil in text box or picture, no set symbol, foil title etc. The picture doesn't really do the sheet justice. The foiling process looks awesome. It's made in small 1 inch x 1 inch squares, so you can still see the lines that divide each square. It's something I don't think they've ever used on anything else. 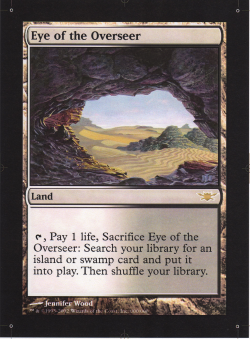 Uncut Foil Sheet 1 of Exodus Test Print cards Black Border without Star Second Series and white back. Cards from the top 4 rows. No Expansion symbol. White back and Non Factory Cut. 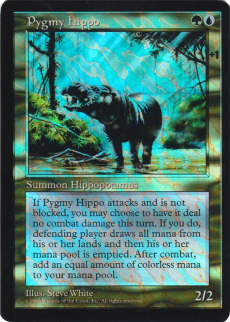 Survival of the Fittest and Pygmy Hippo +1 from row 1, Non Factory Cut. Entirely foiled. The cardstock is a little thicker than normal Magic cardstock. The backside is white. The Plaguebearer and Memory Crystal +1 from Row 2, Non Factory Cut. 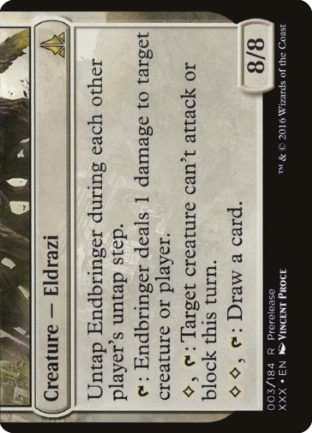 No foil in the text box. The cardstock is a little thicker than normal Magic cardstock. The backside is white. 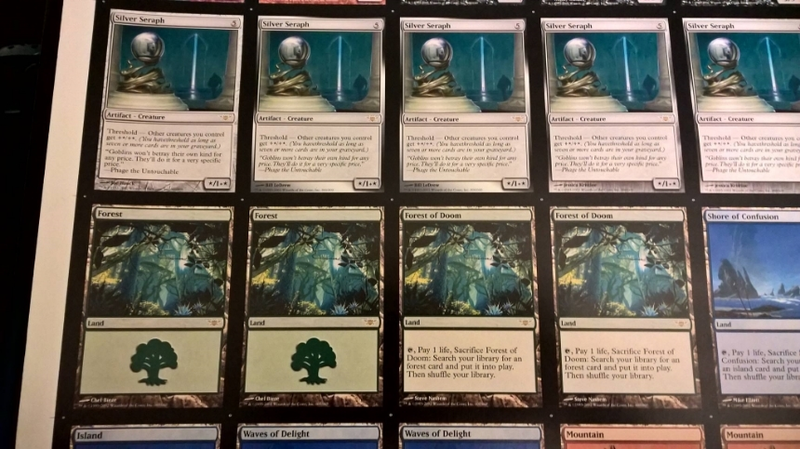 Mana Breach and Oath of Lieges +1 from row 3, Non Factory Cut. 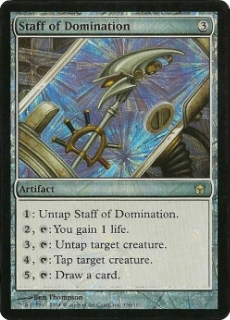 Only the card frame as well as the white text are foil. The cardstock is a little thicker than normal Magic cardstock. The backside is white. Fighting Chance and City of Traitors -1 from Row 4, Non Factory Cut. Entirely foiled. The cardstock is a little thicker than normal Magic cardstock. The backside is white. Filler with camoflage pattern that repeats every .75 inches. Non Factory Cut with white back. 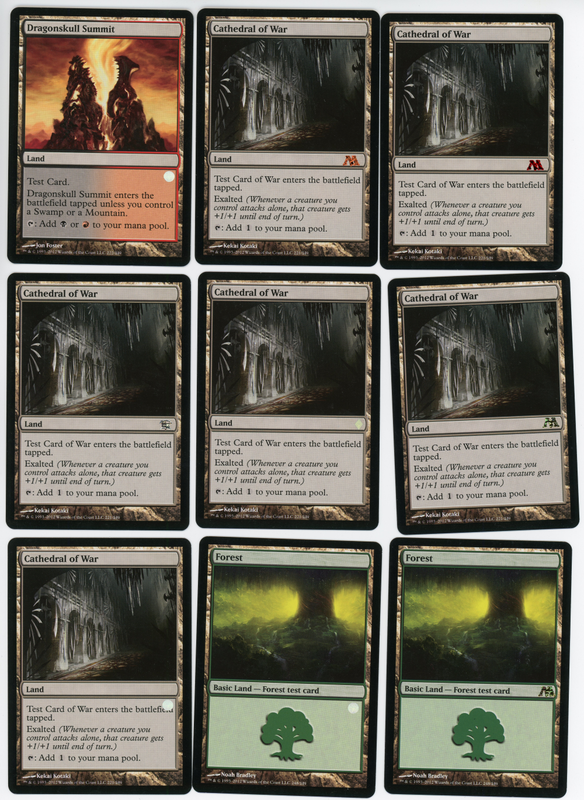 Uncut Foil Sheet 2 of Exodus Test Prints cards Black Border without Star Second Series and white back. 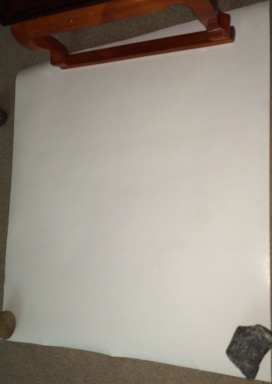 Info that came in November 2018: Two sheets were printed and one of them was uncut. 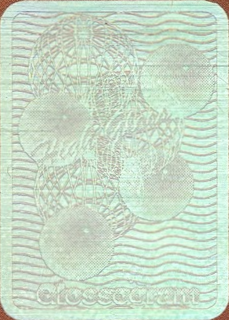 The second sheet was cut and half of it (one set) was used for demonstration and was given around. Only a hand of these cards ever appeared in circulation. 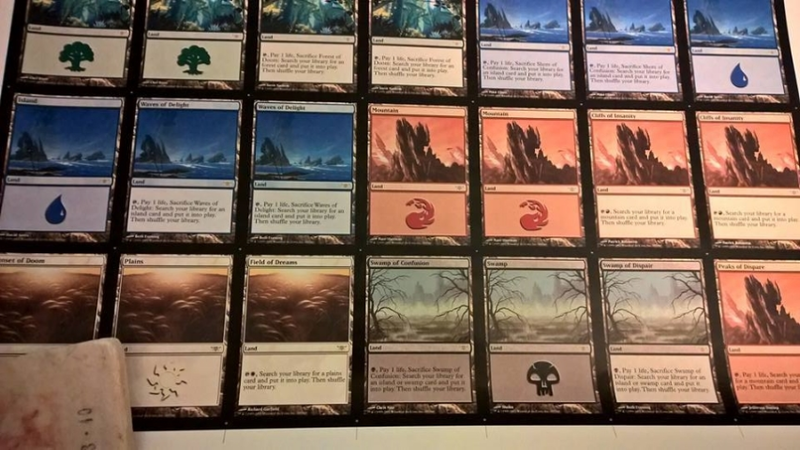 The second 55 cards where kept together and sold as a complete set at a convention by an ex Wizards of the Coast employee who was in charge of these and had access to the set. 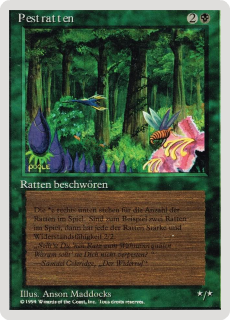 All the cards are in German but have the 1994 copyright text in French. 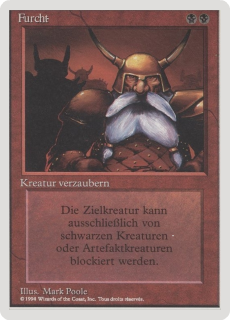 The card name is in German but they have the illustration, casting cost, text, flavor text and power/toughness of another card. Multiple copies of each exist. 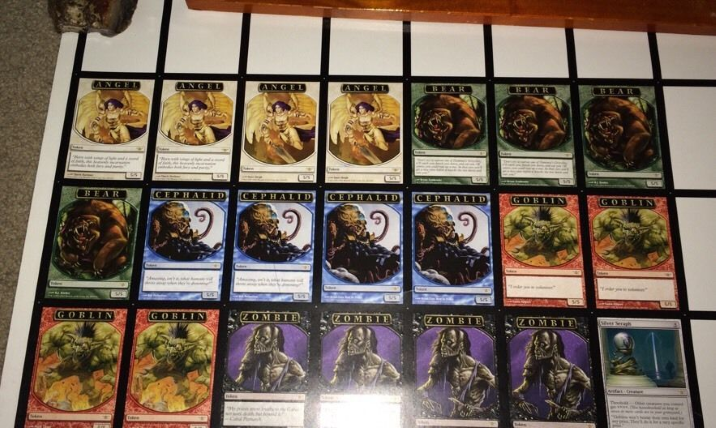 Different info gathered by WotC employees indicates that they were testing fonts, spacing and card stock and used images and what not that they had available on the computer. 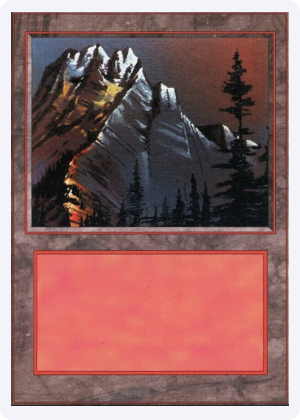 Cards are made on an inferior card stock and indeed they do not stand up to the bend test (they crease). 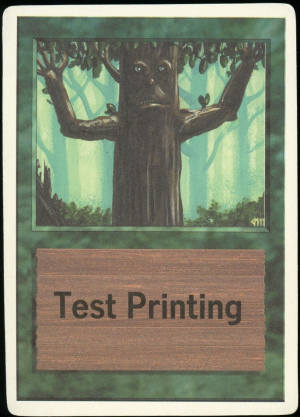 The card thickness of these test prints is the same as regular cards, 0.012 inches thick (.3048 mm), and are .02 inches (.5 mm) taller than regular cards. 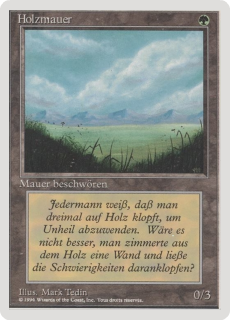 All of the cards have white border Front and MTG black border backs with different variations, while some others have a white border back. Apparently only one card was sent to Amy Weber the "Waldfeen/Mesa Pegasus/Scryb Sprites" as a definite printing with what looks like a normal card stock (I'm working on the subject with another member in December 2015) and resisting the bend test. 50 copies were sent to her along with some regular Artist Proofs. 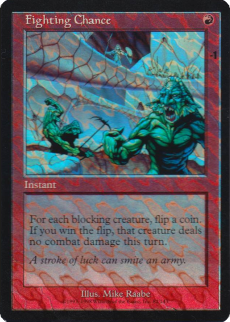 From the auction listing:"This is a misprinted card from the collectable card game Magic: The Gathering. 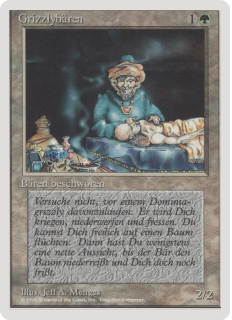 I am pretty sure this is a counterfeit card but I thought someone might enjoy it for their collection. 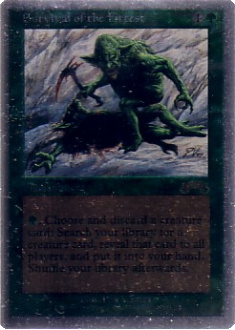 It was given to me when I worked at Wizards of the Coast. It is in mint unused condition. The artist Amy Weber is the one selling the card." 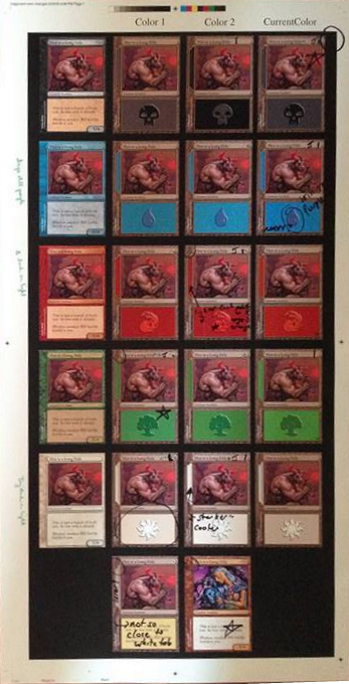 In 2014, someone has found 17 copies of the Unholy Strength / Blue Elemental Blast with black border back. 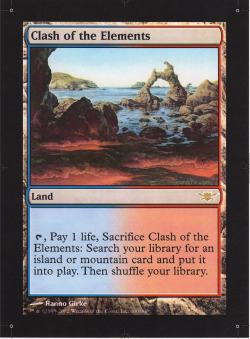 French Copyright: © 1994 Wizards of the Coast, Inc. Tous droits réservés. Text box: Text from ? What was tested: Cellphone activation related no extra information on how it was going to work or if it was ever really tried or anything. 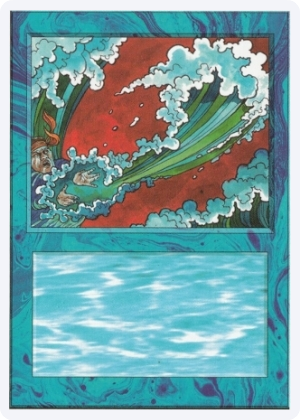 Possible explanations of how it could be used: It's to activate the card ability. 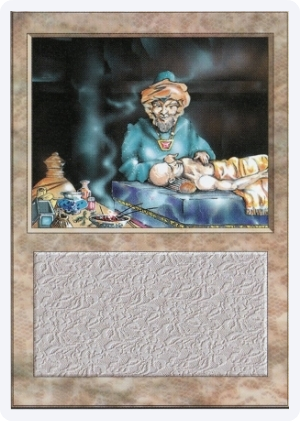 The website (or phone application) told you what the card did. They probably designed a mobile phone application to go with these cards. 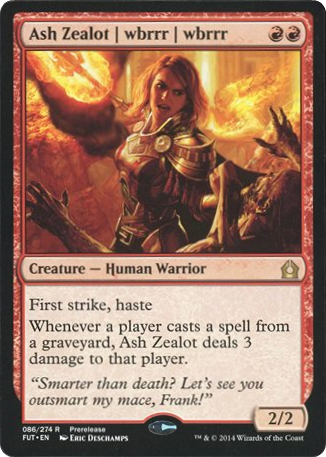 Sort of like how some of the old video game cards would have random abilities. This provides more options than can be printed on the card, and also allows the ability to be unpredictable. I'm still guessing it's a phone application. It would be fun, but not practical since not every player has a cellphone. 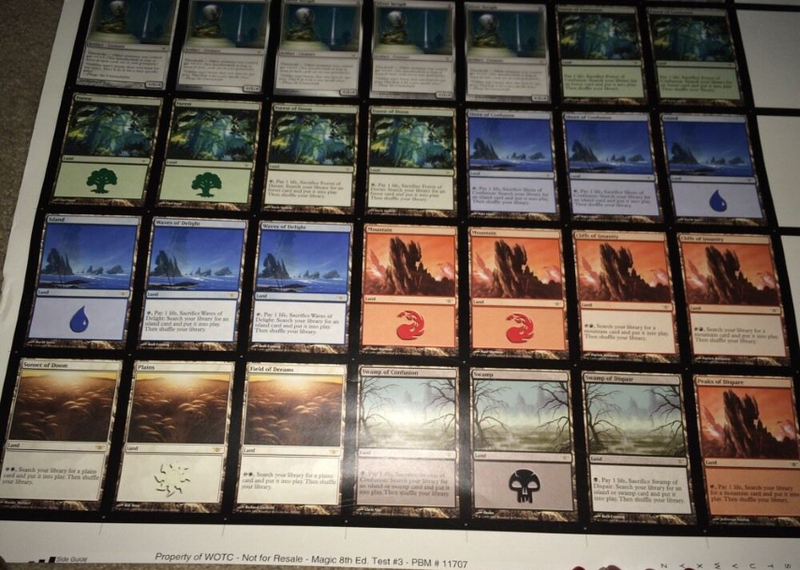 Prior to the release of M15, test prints were created. 2 Complete sets of 165 test prints exist and some extras, for a total of approximately 500 Test Prints. 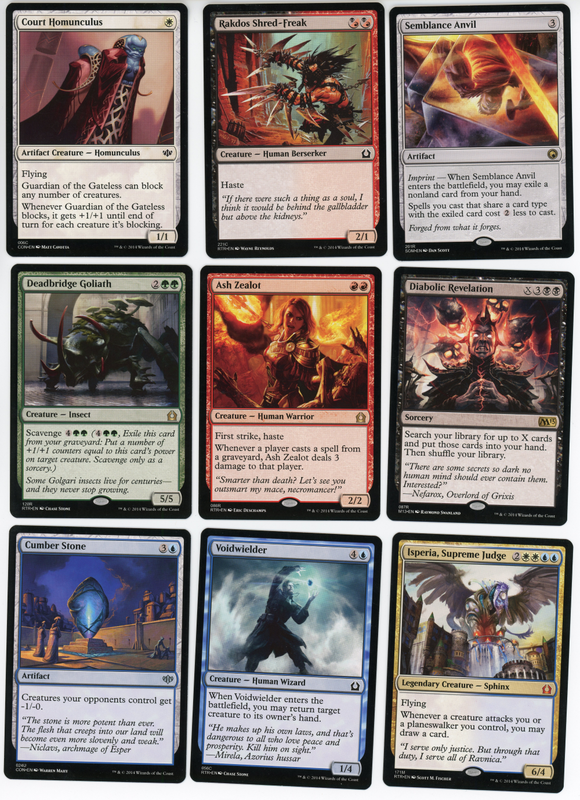 Half of the cards used were from Magic 2013 and the others from random expansions: Conflux, Scars of Mirrodin, New Phyrexia, Return to Ravnica, Born of the Gods as well as Special Sets: Magic Commander 2011, From The Vault: Legends. They all have MTG back and same thickness as regular cards. No further info from the moment. Court Homunculus.  Conflux Common Symbol. Cumber Stone. 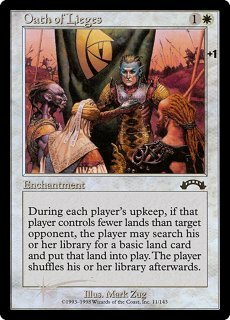 Conflux Uncommon symbol. 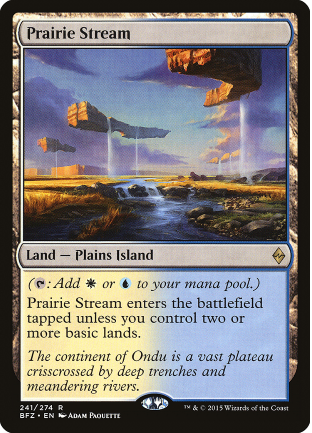 *Plains. Return to Ravnica Common symbol. Artist John Avon instead of Richard Wright. 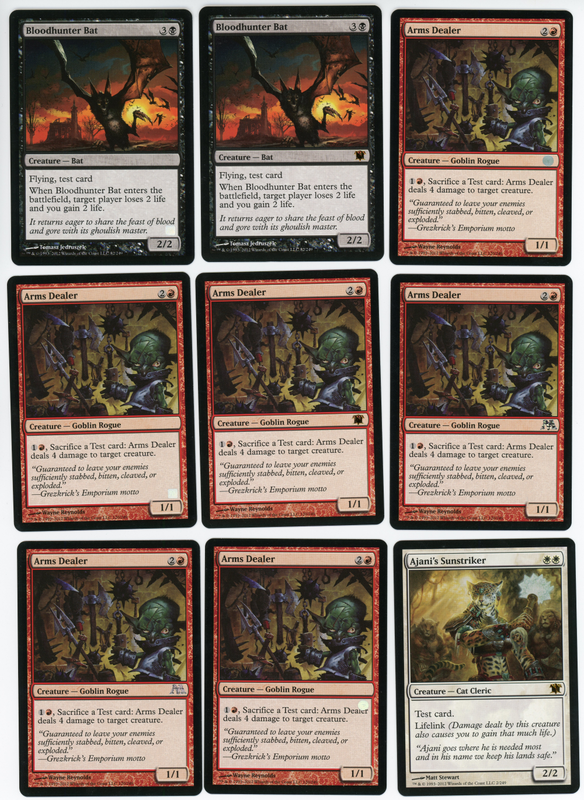 Rakdos Shred-Freak. 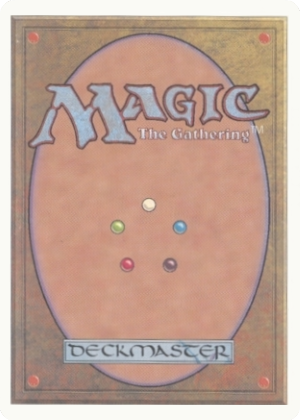 Return to Ravnica Common symbol. No watermark. Plains. Return to Ravnica Common symbol. Artist John Avon instead of Richard Wright. 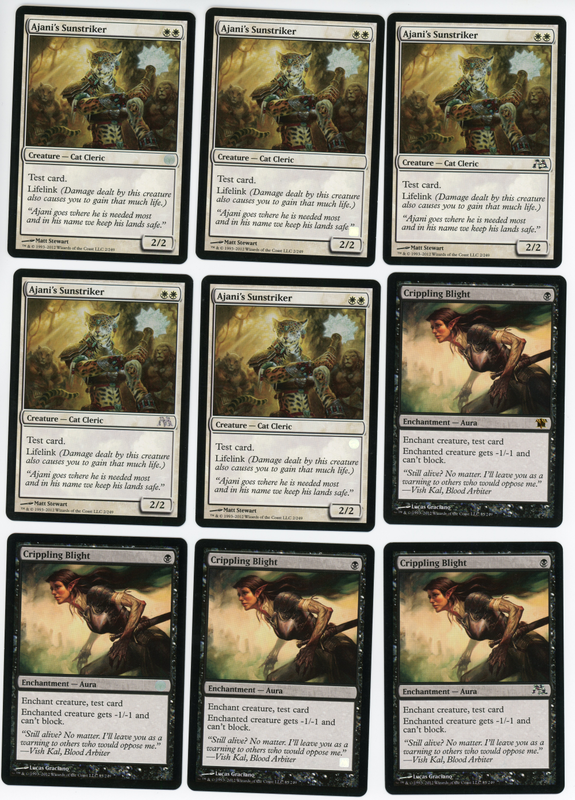 It is rumored that only 11 copies of this foil Planeswalker test print series are known to exist: two white Planewalkers, three blue Planewalkers, one black Planeswalker, four red Planewalkers and one green Planeswalker. 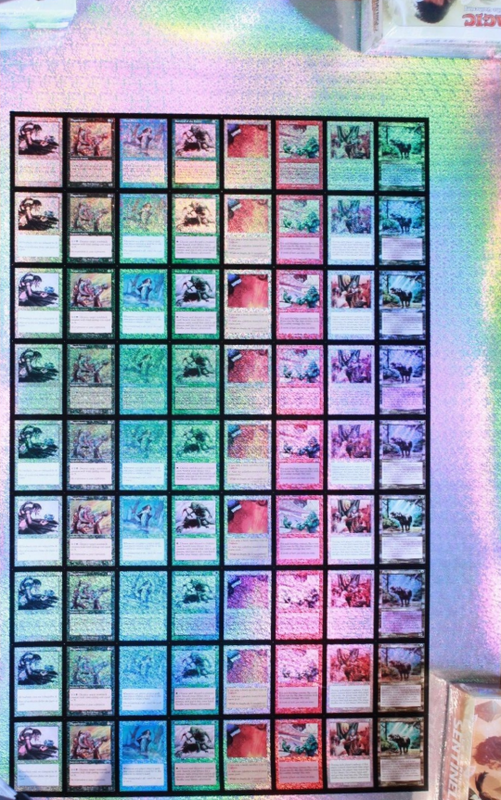 Four sheets of transparent negative film, the Black, Cyan, Yallow, and Magenta plates for the lower left quadrant of the printing plate for rare cards for a production run of Revised, showing font errors. Because of the errors, this set of films was unacceptable and a new set was run. Pre-production Revised rare quadrant plate films (CMYK company in Seattle) and full color match proof. This set of items is from preproduction development and is dated October 4, 1993 (Beta release). 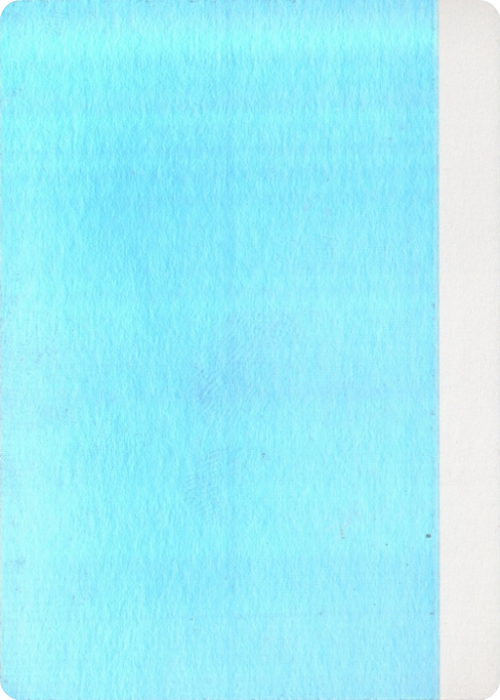 They are four individual positive transparency films of Cyan, Magenta, Yellow, and Black from the lower left quadrant of the rare sheet (i.e., you can remove the black transparency and have a textless Time Walk) placed on a white cardstock paper. 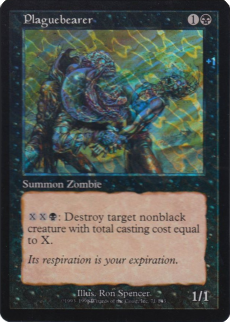 Additionally, there is also a full color match proof on Imation MatchPrint Commercial Base paper for this quadrant. Because it was showing font errors, the set of films was unacceptable, and a new set was run. At least two sets are known to exist. 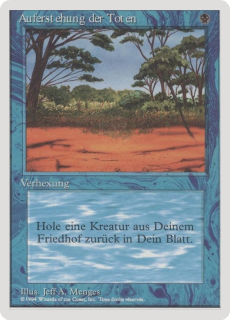 On the front of the Transparencies and the match proof sheet, it's written: "Aldus Preprint"
On the back of the match proof sheet, it's written: "IMATION MATCHPRINT Commercial base "
Lich = Different text + Error double "f" becomes "V"
Tropical Island = Different text + Misalignment mana symbol + Symbol "T" (Tap) + Error double "f" becomes "V"
Bayou =	Different text + Misalignment mana symbol + Symbol "T" (Tap) + Error double"f" becomes "V"
Demonic Horde =	Different text + Misalignment mana symbol + Symbol "T" (Tap) + Wrong "1"
Scrublands = Different text + misalignment mana symbol + symbol "T" (Tap) + error double "f" becomes "V"
Shivan Dragon =	Misalignment mana symbol + Wrong "1"
Power Surge = Different text + Wrong "1"
Underground Sea = Different text + Misalignment mana symbol + Symbol "T" (Tap) + Error double "f" becomes "V"
Dave Howell: It's a matchproof, but not a Fujiproof. The Fujiproof system laminated the layers together so you couldn't lift them up and separate them. Most of the typos were due to the fact that the extended character set for the text font didn't get loaded to the imagesetter correctly.  The "ff" in "affected", for example, is not two letter "f"s. It's a single glyph, known as a ligature, that looks like two f's that are joined together. We only ran film for the beta cards that needed to be changed. 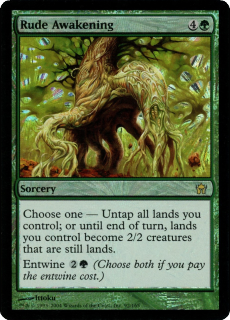 Unchanged Betas were printed with the same films that the alpha cards were run from. 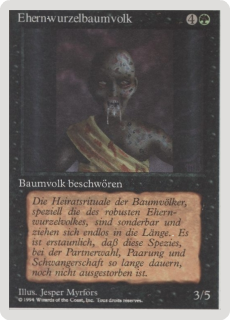 Can you explain how the black border was removed for printing? 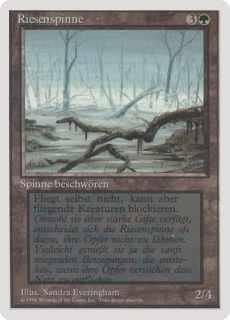 Did the black border removal require burning film, or was the existing black printing plate modified somehow perhaps? Dave Howell: Carta Mundi did the equivalent of laying strips of white tape between the images on the printing plate films. We wanted unltd to be gray, but that would have required a 'screen' of little black dots. They could only do solid modifications. That meant black, white, red, yellow, green, cyan, magenta, or dark blue. 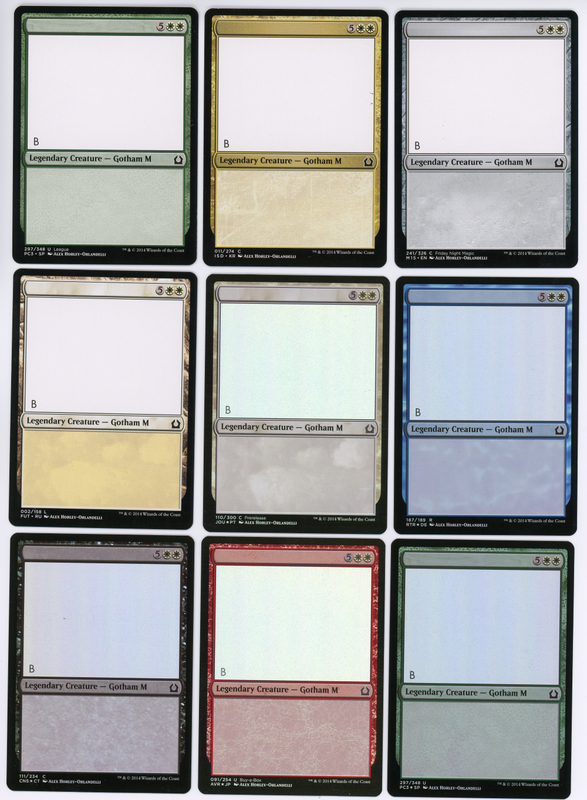 The color options would have looked hideous against some of the card colors, so white it was. I'm pretty sure they created a new set of printing plates, but the plates were made from the same films that they'd used for Beta. Their plate camera could do 'step-and-repeat," so swapping in cards from the alpha plates was done the same way. Their camera would 'blank out" the old card, leaving the plate unexposed for that item, then they'd use the new film to expose that part of the plate before developing the plate. 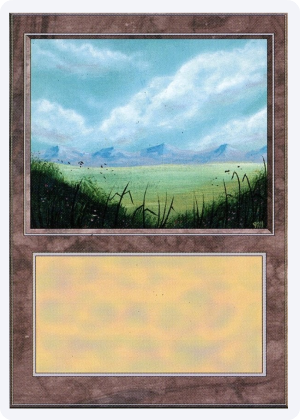 QUESTION: So were any gray bordered cards ever tested around the time of Unlimited? Dave Howell: I don't remember. We didn't have a good way to print color proofs ourself at the time. This was before affordable color inkjet printers existed, basically. 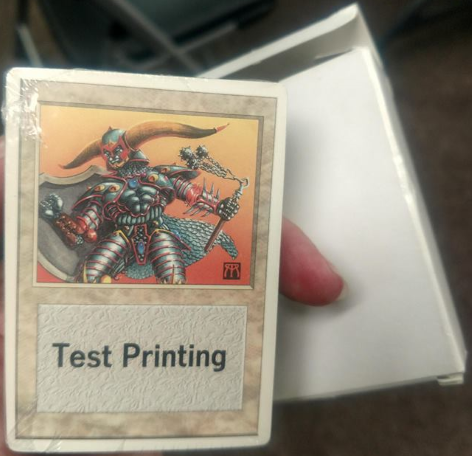 Even trying to print a black-and-white proof of a single card on the laser printer took about 10 minutes to send the file to the printer and have it process the image. 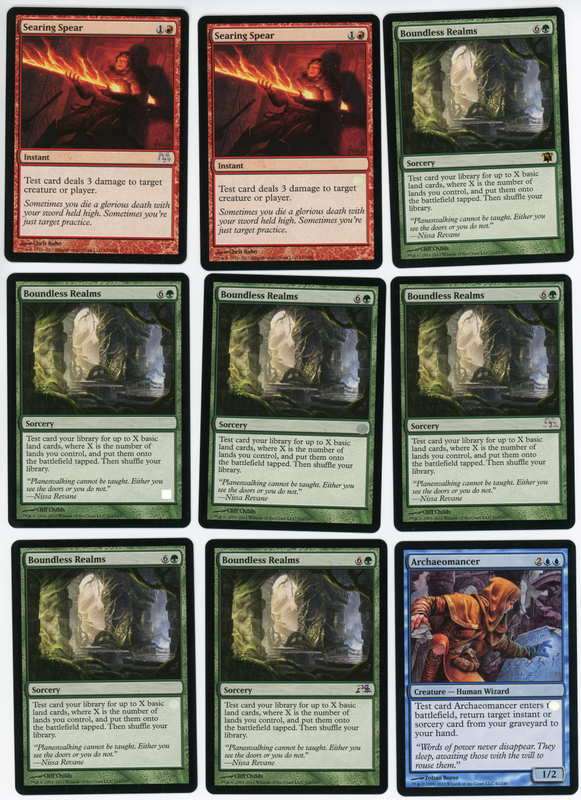 Trying to do test proofs of the whole set was impossible. A single page with 9 cards took well over an hour to come out of the printer. COMMENT: Dave you're right it is not a fujiproof, my mistake. On the back of the sheet we can read: "IMATION MATCHPRINT Commercial base " and on the front probably the printer name : "Aldus Preprint"
Dave Howell: No worries. I doubt anybody else really is terribly concerned about exactly what kind of proof it is. "Aldus PrePrint" is the software that generated the color separations. The quadrants were "printed" from Aldus Freehand as PostScript files, (not Encapsulated PostScript, but actual .ps files), then processed by PrePrint to create four new postscript files, one each for the C, M, Y, and K printing plates. The new files were reversed left to right and were reversed light-to-dark, in order to create "negative emulsion-side-down" film. 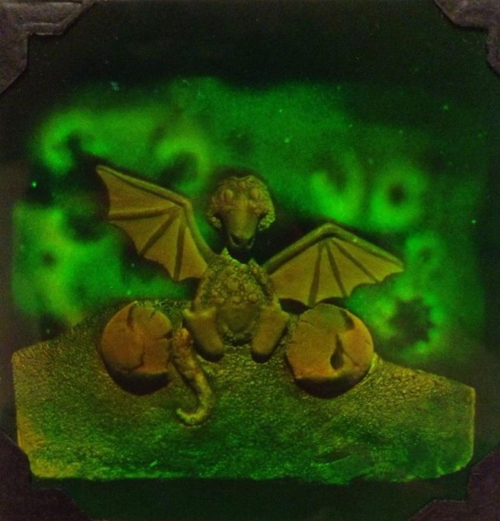 Those films were then laid on special photosensitive plastic sheets and exposed to UV light. 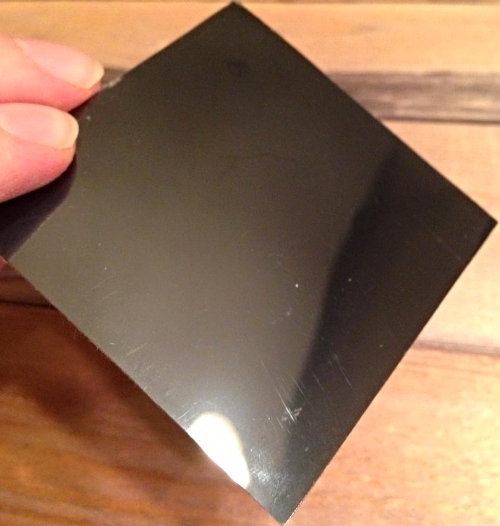 The plastic sheets had C, M, Y, and K (blacK) photosensitive dye. 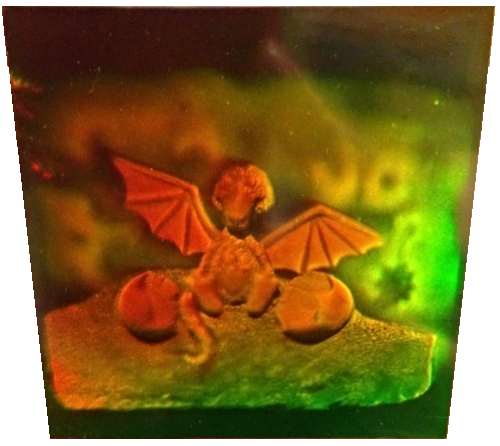 Dye exposed to the UV was made permanent. The rest was washed away. Those sheets are then stacked one on the other to replicate what will happen when a printing press prints those ink colors. QUESTION: Stupid question maybe.. but how Come there is the crooked "T" (revised) instead of the word "tap" ? Dave Howell: It started out when Richard, Skaff, possibly Jim, and myself were trying to define the difference between mono and poly artifacts. 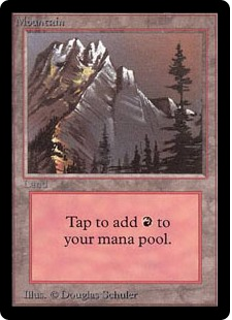 At some point, I realized that the only difference between them was that mono artifacts functioned like land ("Tap to") and poly artifacts worked like enchantments, so we could drop the distinction and just call all of them "Artifacts" by simply requiring tapping or not as a cost when using an artifact. 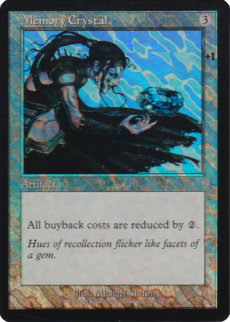 "Since it's functionally a cost, just like a mana cost, we could even dispense with saying "tap to" entirely, and just have some kind of tap symbol instead." I know, it seems terribly obvious now. :)The logical extension was to use the tap symbol for all magic cards that tapped. I also came up with the tipped-T for the symbol. It had to be replaced with the arrow-version when we started doing other languages. The word for "tap" doesn't always begin with a "T". QUESTION:That's a great explanation, thanks. I think that part of the question was why does the tap symbol appear on this item which is dated 10-4-1993. 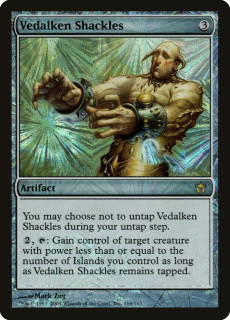 Beta cards don't use the tap symbol, so does that mean this item was created after Beta was sent to be printed? Or perhaps since Alpha and Beta are both the same set called Limited Edition, it was just easier to save the newly invented tap symbol for the next set being made? Dave Howell: *Everything* happened after "beta was sent to be printed." 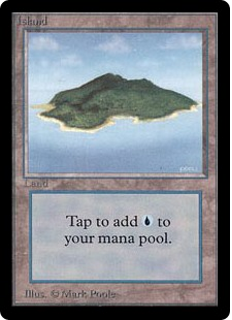 In fact, we hadn't invented the tap symbol until after GenCon, I think. I think we'd shipped the film for Arabian before Oct. 3rd, but I'd have to do some research to be certain. This proof wasn't made for the Beta edition. It's actually The Regathering. 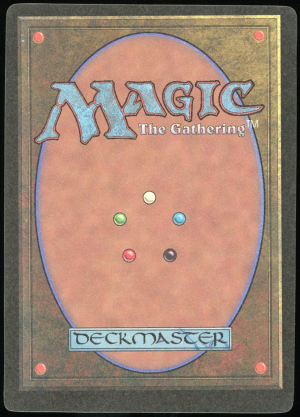 I believe if you look carefully, you'll find that some of the cards have text that's been changed from the published Beta editions. 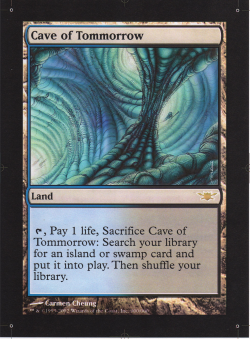 The key is the closeup of Underground Sea. 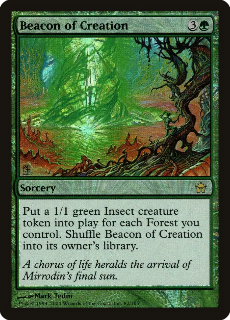 Look at the mana symbols in the text. The *colored* part of the symbol came detached from the icon. 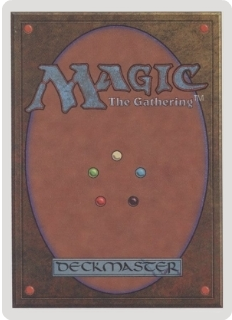 QUESTION: The Regathering being Unlimited edition ? 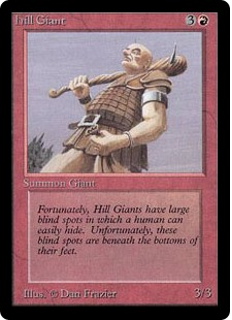 Or is this a very early first pass at Revised, before the decision to axe the P9, Gauntlet, Berserk, etc ? Thanks so much for helping to clear everything up Dave! Dave Howell: The idea was to run a new set of films for the 2nd edition, with a bunch of improved or revised text for the cards. 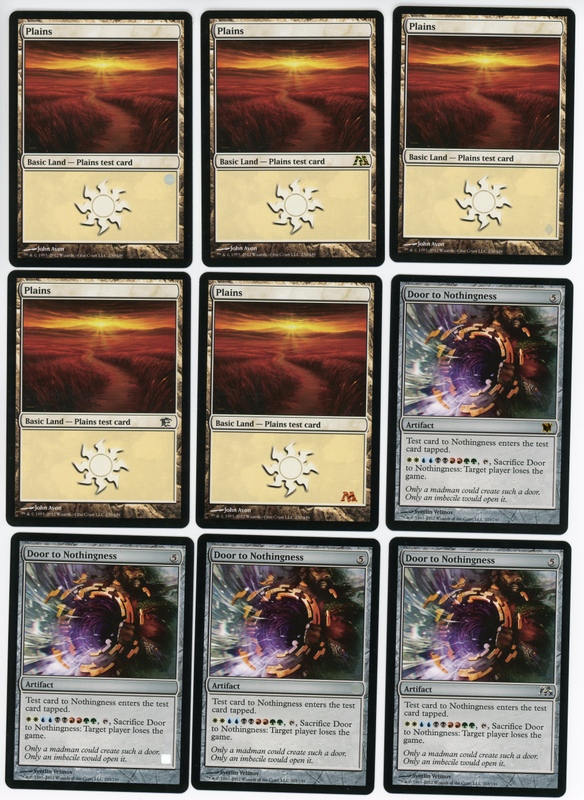 But PrePrint had a serous bug in it, which was making a mess of the mana symbols. In order to fix it, I actually walked right into their offices and made them fix the problem while I waited. The solution was upgrading from 1.5.1 to 1.6. "You call us and order it and we'll send you the upgrade." "How long?" "About a week." "Not acceptable. This is supposed to have shipped yesterday. Upgrade me right now. I'll wait." In the end, we decided to give up, because we had to get to work on Arabian Nights. 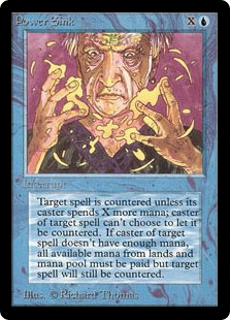 However, that meant we would run out of core set cards. So that's why we came up with the idea of "unlimited." The original plan was another, larger, limited edition. 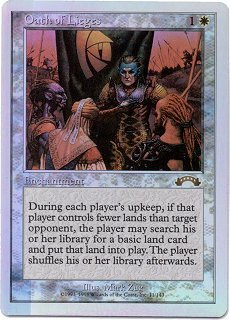 QUESTION: So essentially Unlimited was rushed out the door and the big changes you guys had in mind were saved for Revised ? 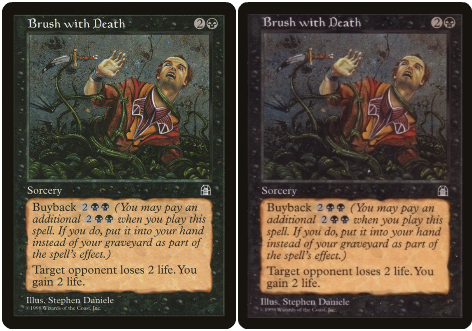 Dave Howell: Not "rushed out the door," because Unlimited is simply Beta with white borders. We just called Carta Mundi and said "can you change the border color on the films you have now ?" 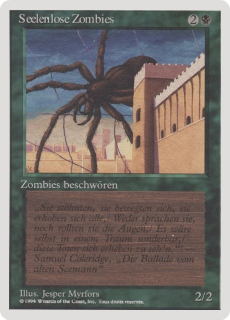 If you look at the archival MtG info on my personal website, you'll find the following message: "Our second attempt [to release a new core set] was after Arabian Nights had been released, so we had a list of which 1st edition cards were going to be replaced with Arabian Nights cards. The following list is from a version of the master card-text file with a timestamp of December 3, 1993." I don't remember why we didn't release that one. QUESTION: It's a great website. Very interesting & informative. Dave Howell: I vividly remember being all set to leave early for Christmas so I could go skiing before the holidays, and then having to cancel those plans because the designers & editors kept making changes to Antiquities and blew their deadline, and then there was some kind of production problem with *those* films, so I lost about 3 days and had to skip the ski trip. 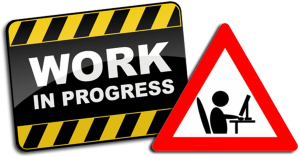 Well, it wasn't going to have a symbol because we were working on it before AN, and we came up with the expansion symbol *after* the AN files were shipped to Belgium. 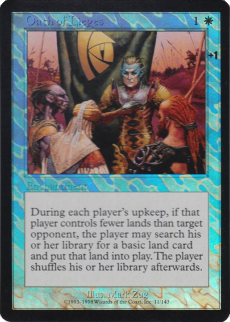 QUESTION: Any idea if gray borders were considered for Regathering, or was that strictly an "Unlimited" idea? Dave Howell: Carta Mundi made it clear that we just couldn't do a gray border, unless we were willing to pay to have a spot color on the press. It's quite possible we weren't planning to do anything. Why would we? 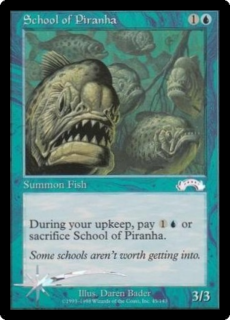 It's a game card. 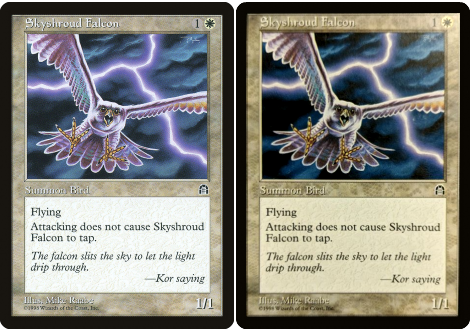 If a newer edition's card was identical to the older edition, who cares? It's a game! If they work the same, they might as well look the same. In other words, we couldn't have cared less about what collectors might want. We were publishing a game, not flat Beanie Babies. Actually, come to think of it, what the original plan probably was, was to change the back. 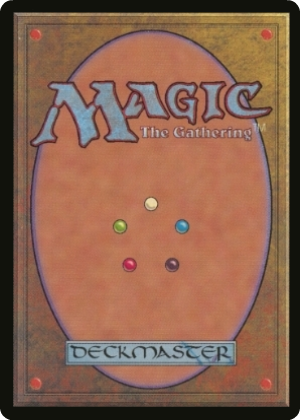 It's called "Magic, the GATHERING" because it was the first edition. 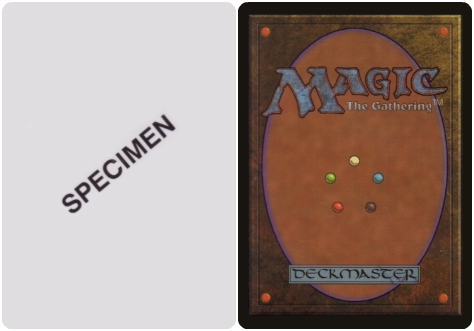 The next one was going to be "Magic: something else". Which, of course, would have made the backs different. COMMENT:I love the Arabian purple back but for the sake of the game (at the time, since sleeves were non-existent) I am very glad it did not change. 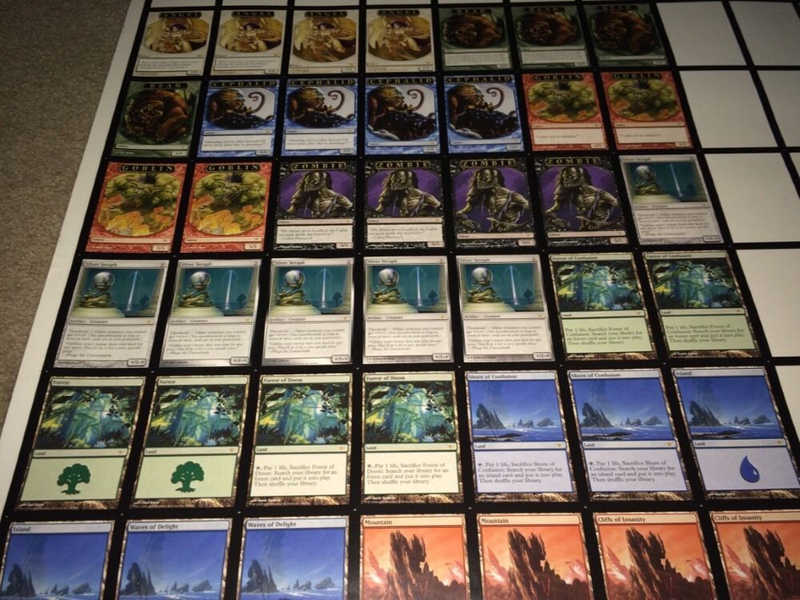 When we were play testing AN, we had laser-printed cards mixed into "normal" MtG decks. 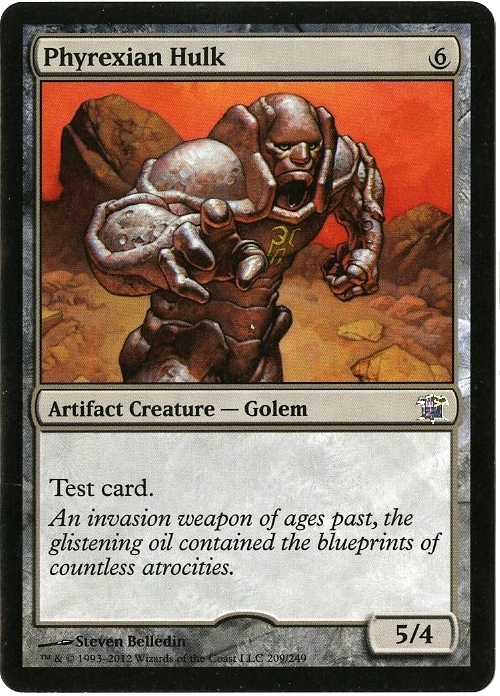 We never found it to be any kind of a problem to be able to identify what set a card was before drawing it. The date on the film isn't the release date. You can see the time-of-day part is cluttered. That's because the quadrant is made from four different layers of film: cyan, magenta, yellow, black, and each layer of film is imaged as its own job. 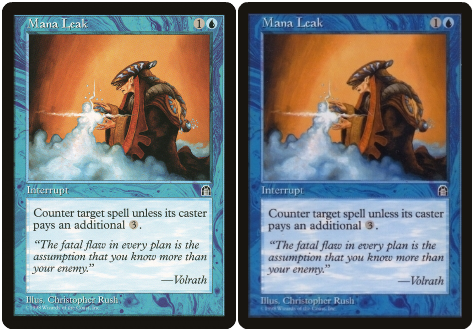 mana symbols have slid off to the left. 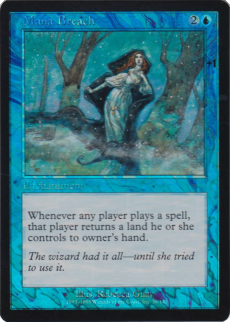 The white and blue circles behind "add" are supposed to be behind the black and blue mana symbols. A Rare and Uncommon sheets (11 X 11) are known to exist. A Common sheet probably exist as well. The Uncommon sheet consists of 4 Black and White sheets of glossy thick photography-like paper (Without any paper stamp on the back). As pictured, these are taped together to form an 11 x 11 grid. 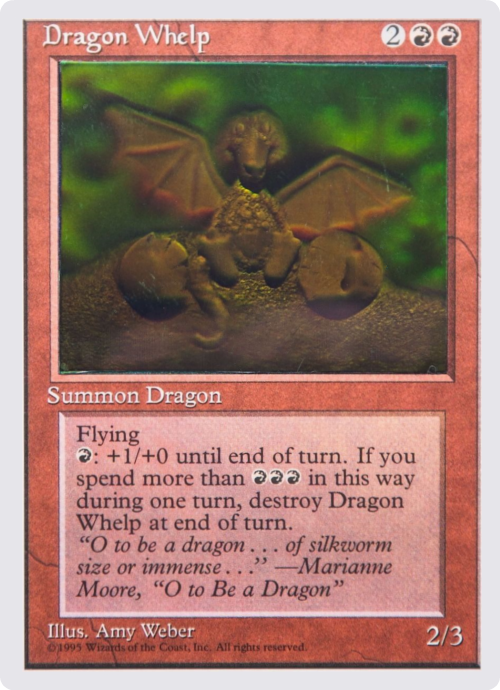 An even earlier attempt to use the hologram technology for Magic cards has been made on a single Dragon Whelp card, where the original artwork had been replaced by a separate hologram embedded into the cardstock, at least 3 Revised cards are known to exist. This method had supposedly been rejected because of its high production costs. 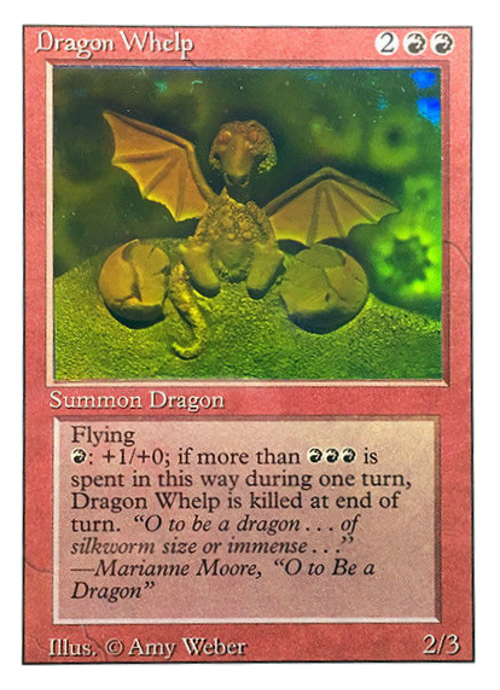 In 2014, the Artist Amy Weber sold an holographic Dragon Whelp sticker not on top of cardstock. 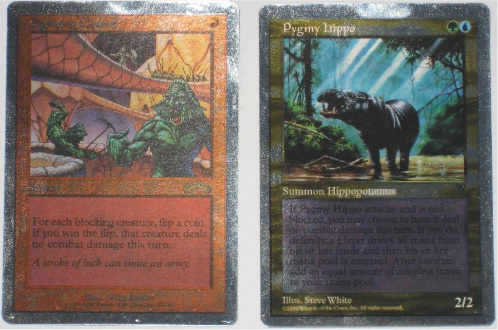 Apparently 4 Holographic Dragon Whelp were made by Krystal Holographics in Logan, UT (now DuPont Holographics Inc). 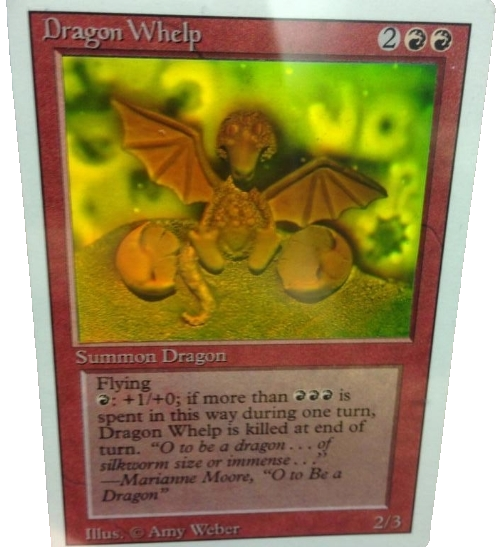 The Dragon Whelp sticker is mounted on a Fourth edition Dragon Whelp card that was to be presented as a prototype to Wizards. It was never pushed into production as the hologram is slightly thicker. 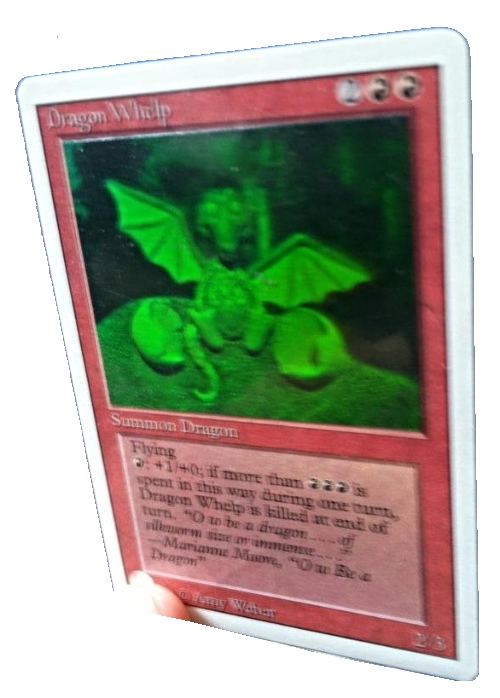 Holographic Fourth Edition Dragon Whelp Sticker on top of cardstock front. It was sold for $3,050.00 in May 31, 2016. 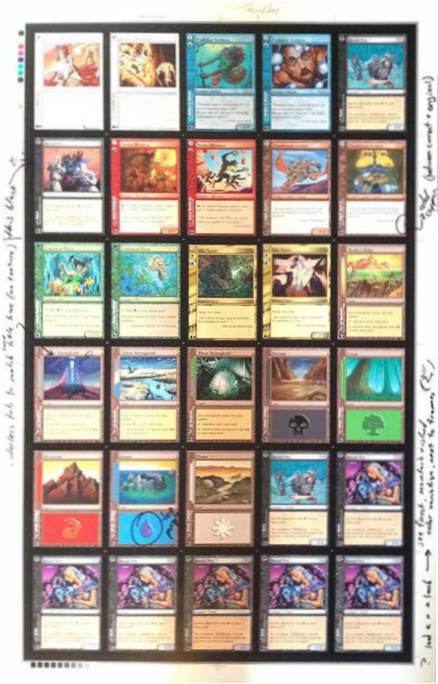 After discovering the "Specimen" cards, Shaun (who helps me out at the store) took 15 of them to a larger magic event in Columbus to test the waters and see if anyone had seen anything like them or could suggest a value (or make an offer). At this time, these were the only specimen cards I had seen and if I remember correctly, we had not yet seen the "number" cards. 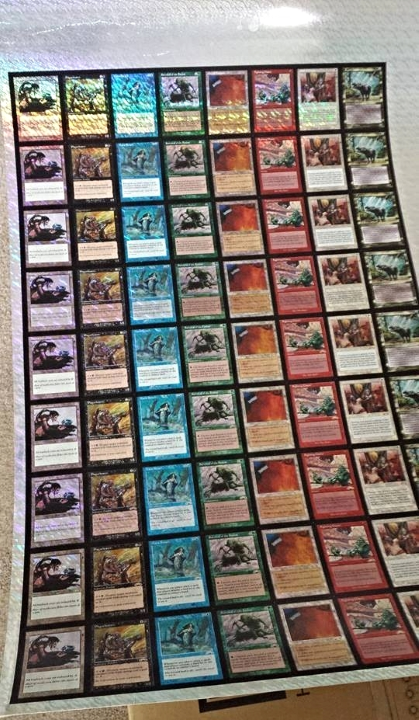 I had a customer (we call him "Wiley") purchase this specimen pack (which came from a Chinese 5th booster box) and after shopping it around locally and no one making an offer on it, he traded the pack back to me (I wasn't at the store when he originally purchased it). One person in Columbus was quite interested in the cards (I believe his id here is Johnstown), but unfortunately Shaun nor anyone he went with made second day and he couldn't locate the interested party before leaving the event. Upon his return to the store, I decided to list one of the specimen that I had a duplicate of on Ebay. I have not listed one since. The person listing on ebay (royal T) is not me and is not selling on my behalf. The "specimen" box was mostly Chinese 5th packs (meaning, most of the packs were what they were supposed to be), so after the one pack was traded back to me, I opened a few packs and hit nothing but Chinese 5th, so I figured it was a one shot deal and left the packs on the shelf. Then, a day or 2 later, I arrive at the store and "Royal T" and Shaun are opening packs and saying "look at this craziness" and show me some cards with colored numbers on them. After Shaun and and Royal T get a few packs for themselves, I decide to pull the Chinese 5th and Shaun and I open what's left of that box and another box. At this time, I assumed "Royal T" only had number cards (as that's all that Shaun and I opened from these packs), but it turns out he hits some specimens as well (I think about 3 packs worth). The "Specimen" cards were running 15 specimen per pack (full packs were all Specimen). In addition to mine, Royal T's and Shaun's, there is one other pack that I am aware of (about 6 packs worth total that I am aware that exist). 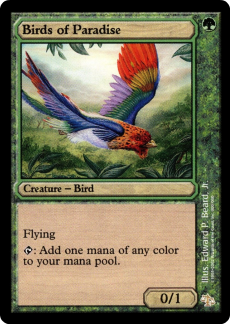 Specimen Cards are only commons from Stronghold. 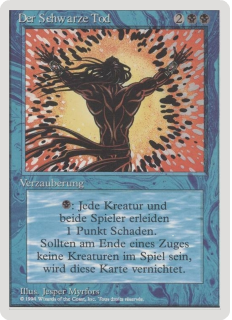 The cards are quite miscolored, they are very dark for all the colors and for example the black color tends to fade into a very nice dark blue. Those are probably Stronghold Test Prints that were meant for destruction, but somehow ended up in Fifth Edition (V symbol) Simplified Chinese booster boxes instead. 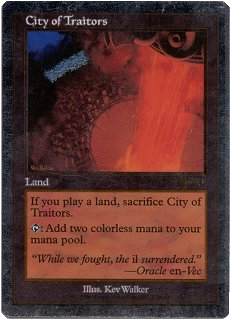 List of the 26 Commons cards illustrations known to exist, more were available. 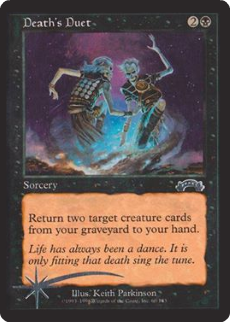 For some cards, 2 are known to exist. There's only 55 Commons in Stronghold, so there's a possibility that the others 29 missing commons exist (to be verified). 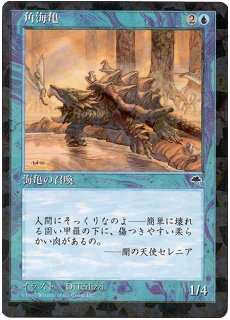 The Japanese Tempest Horned Turtle card has been given a holographic treatment, appearing as a pattern of crystalline triangles on top of the card surface. This card has existed in other languages, including English, but most copies have been destroyed. 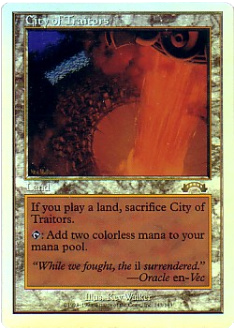 It is possibly another experimental foil card, preceding the Exodus foil project. 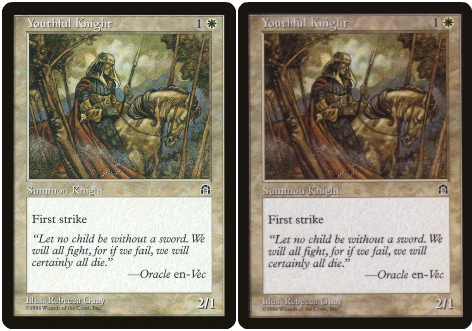 Those Test Prints are on the same card stock as GERMAN/FRENCH COPYRIGHT TEST PRINTS. 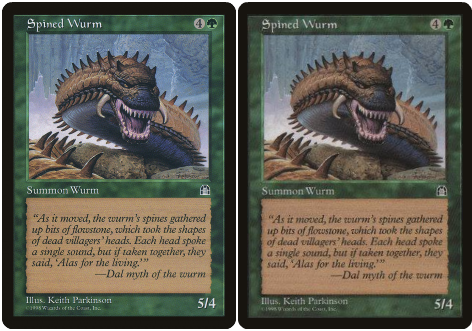 They will not pass the bend test and are slightly oversized compared to a normal card. 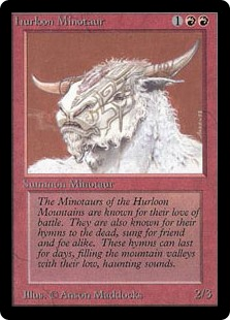 They were all pulled out of the MTG art director desk when Hasbro bought WotC. No additional info is available for the moment. Those Test Prints are slightly undersized compared to a normal card (.5 mm narrower, width, same height as regular cards). 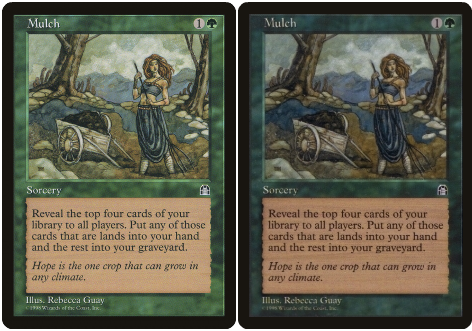 The colors of Textless "Summer Color" Test Print are matching perfectly the colors of Summer Edition Card. 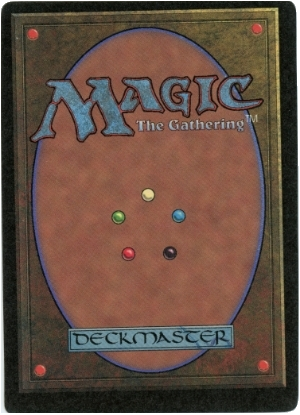 The Textless Test Prints were made in September 1994 as slightly updated card backgrounds. They were made while Summer Magic was being printed and have the same colors as Summer Magic. 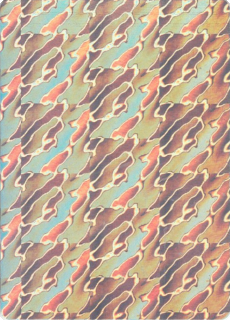 Their new backgrounds were first used on Italian Edition (FBB). Some were pulled out of the MTG art director desk when Hasbro bought WotC. Multiples of them do exist, the precised number is not known. No additional info is available for the moment. At least 8 copies are known to exist. 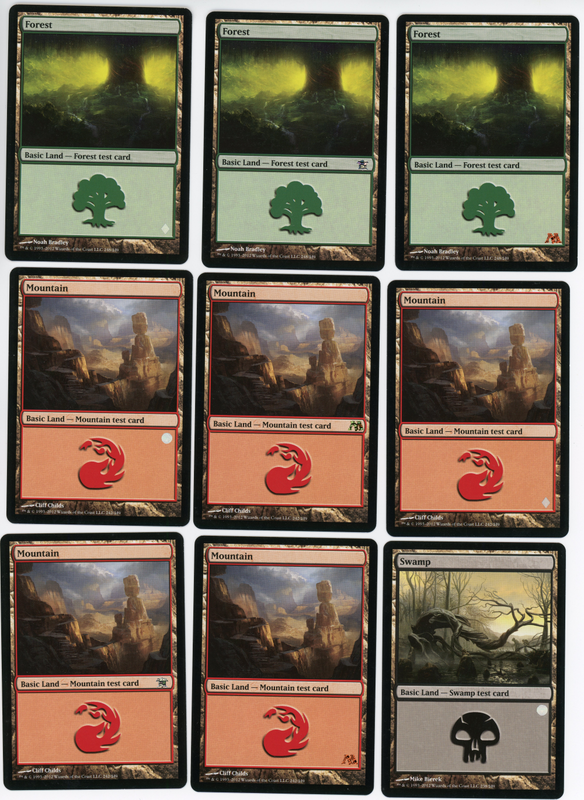 That's the largest number we've seen of any of the cards from the Textless Test Print series. intended to be destroyed, but some were released accidentally. two months of printing (at that time) was wasted. 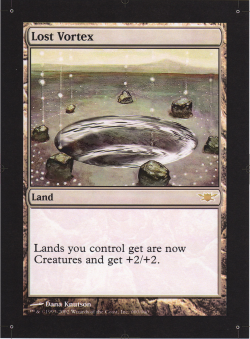 White Foil were used in the production department of WotC to test the star. A lot of different variations exist with left or right part not foiled, on the entire length and different millimeters as well (3mm to 8mm), etc. The problem with these test prints is that once you get a fingerprint on them, it never comes off. 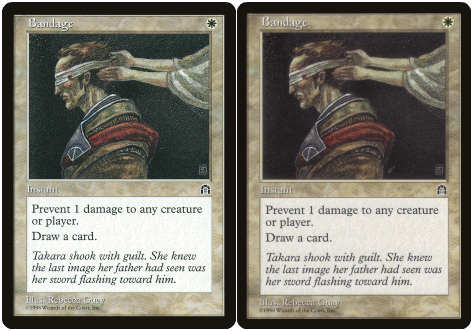 All you've got to do is touch the face of the card and the clear foil image is permanently marred by the finger print. 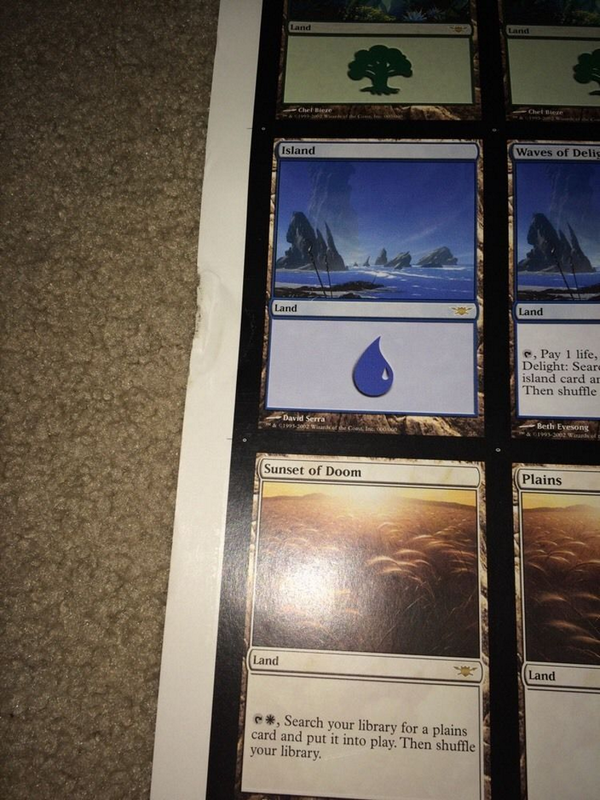 Keeping them in sleeves or touching them only by the edge of the card is the only way to prevent this from happening. White foil Test Print with white right part not foil (fingerprint on the foil part). White foil Test Print with white right part not foil and different foiling on top. White foil Test Print with white left part not foil and black rectangle on the top left foil part.